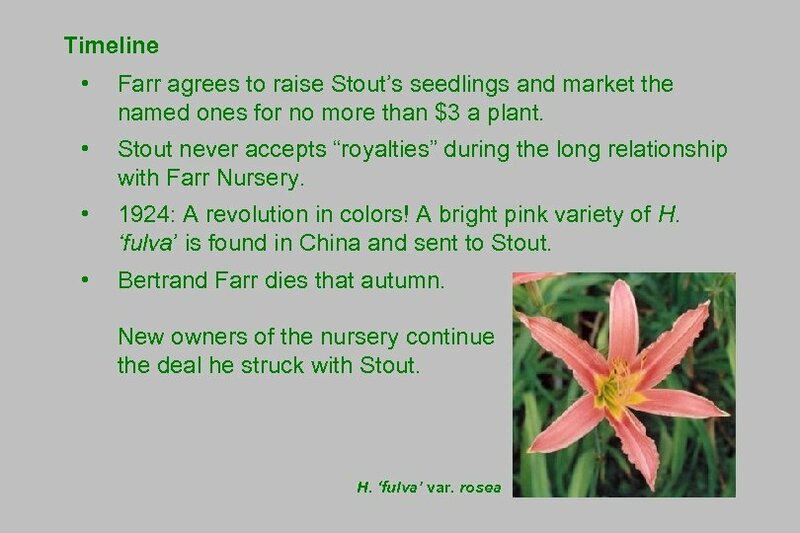 Timeline • 1893: English nurseryman Amos Perry, 22, orders a collection of daylilies. He devotes himself to hybridizing. 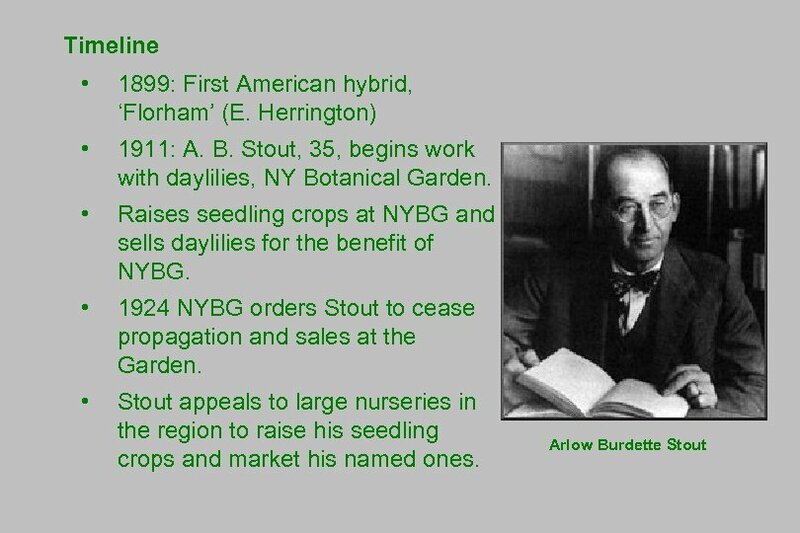 • 1900: Perry’s first named variety. • Yeld and Perry introduce new varieties into the 1930 s. Presumably, they talked to each other. 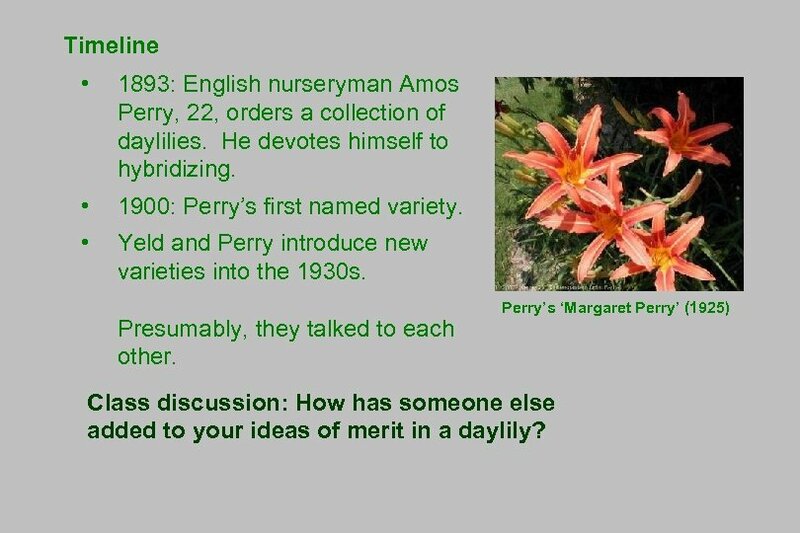 Perry’s ‘Margaret Perry’ (1925) Class discussion: How has someone else added to your ideas of merit in a daylily? Timeline • 1924: Only one nursery owner responds. 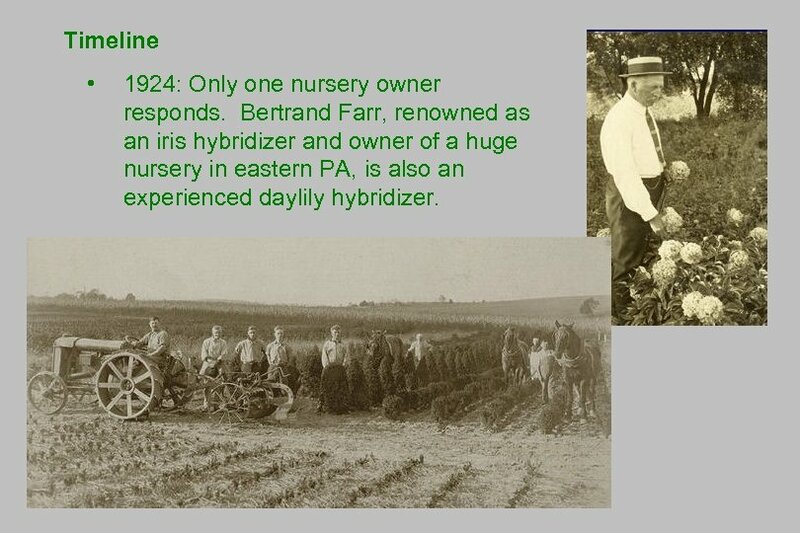 Bertrand Farr, renowned as an iris hybridizer and owner of a huge nursery in eastern PA, is also an experienced daylily hybridizer. Timeline • 1929: Stout introduces the phrase “unusual form” in describing his new hybrid, ‘Wau-bun’. It’s an example of the “pinched crispate” characteristic, with petals pinched back along the midrib. 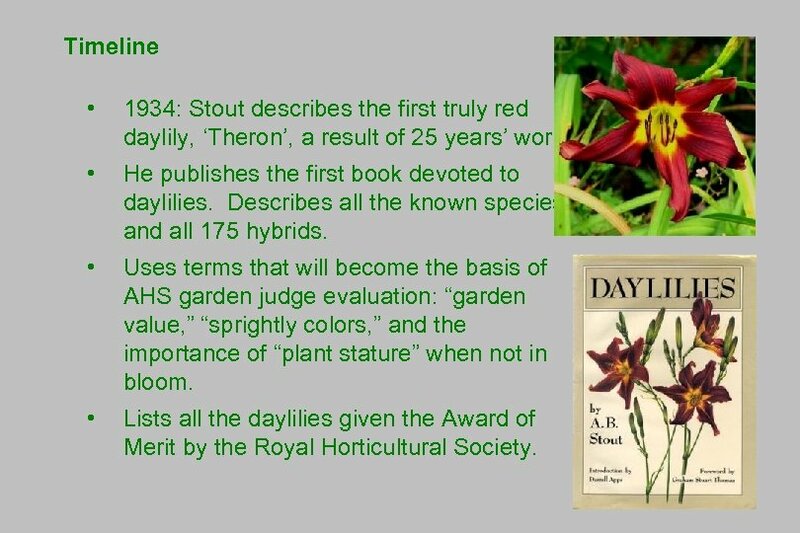 Timeline • 1934: Stout describes the first truly red daylily, ‘Theron’, a result of 25 years’ work. 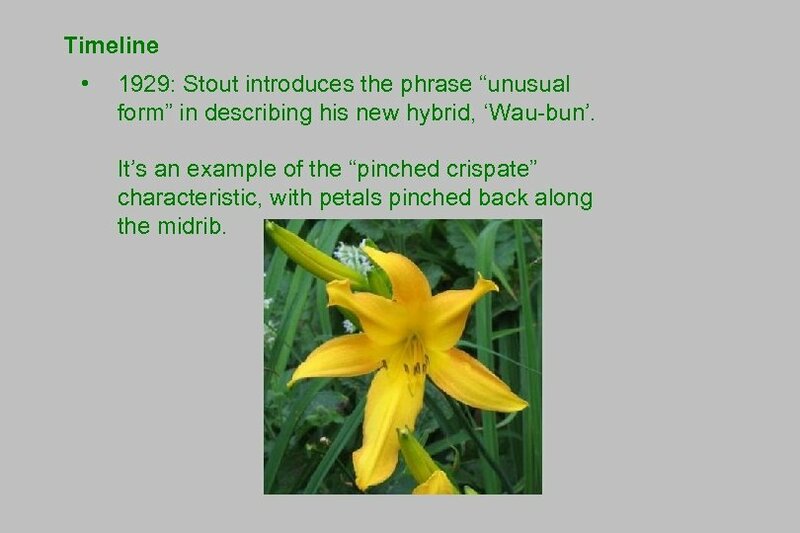 • He publishes the first book devoted to daylilies. Describes all the known species and all 175 hybrids. 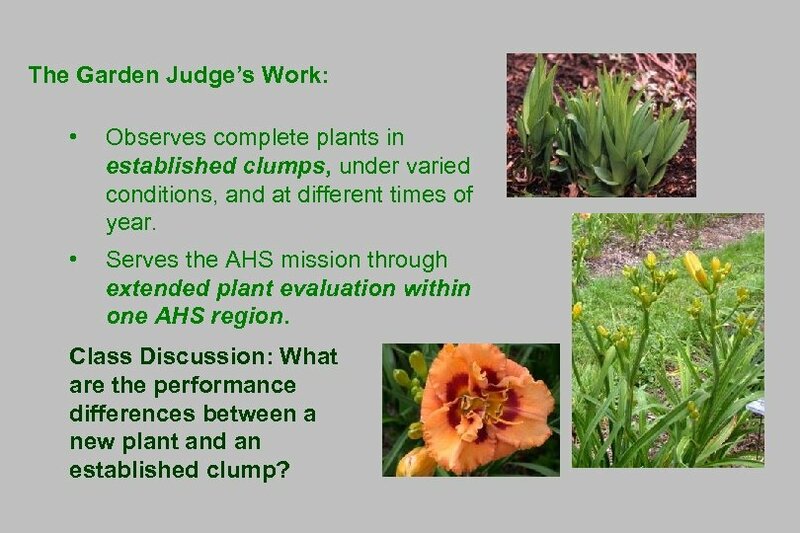 • Uses terms that will become the basis of AHS garden judge evaluation: “garden value, ” “sprightly colors, ” and the importance of “plant stature” when not in bloom. 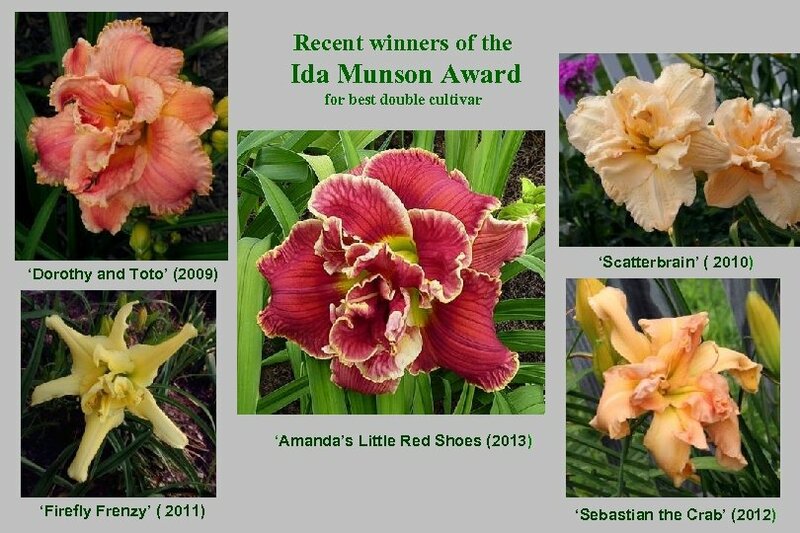 • Lists all the daylilies given the Award of Merit by the Royal Horticultural Society. 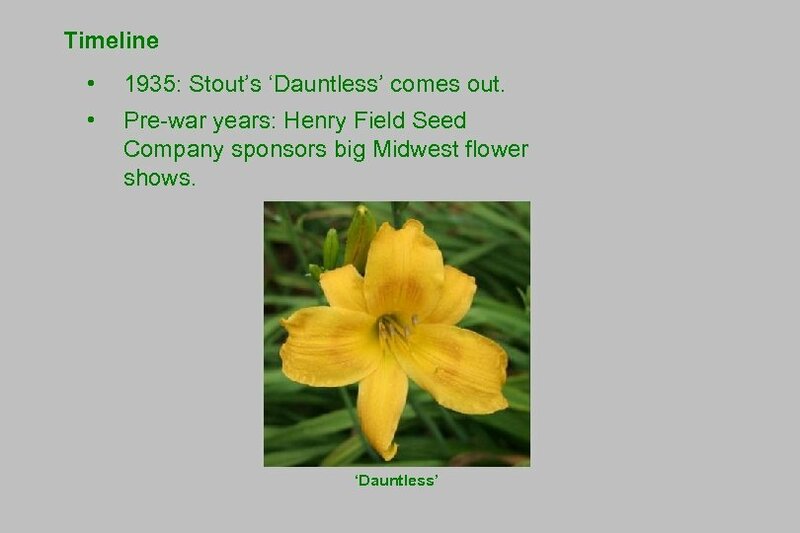 Timeline • 1943: Flower Grower magazine sponsors a Hemerocallis Round Robin. 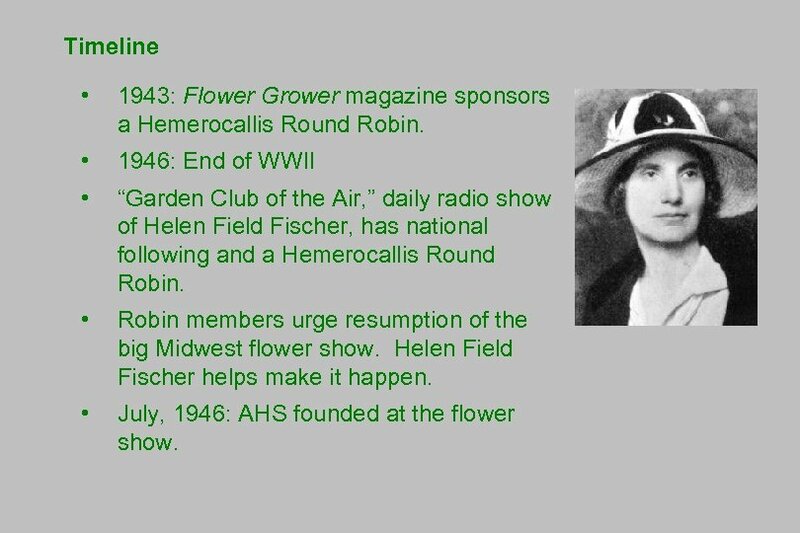 • 1946: End of WWII • “Garden Club of the Air, ” daily radio show of Helen Field Fischer, has national following and a Hemerocallis Round Robin. • Robin members urge resumption of the big Midwest flower show. Helen Field Fischer helps make it happen. • July, 1946: AHS founded at the flower show. 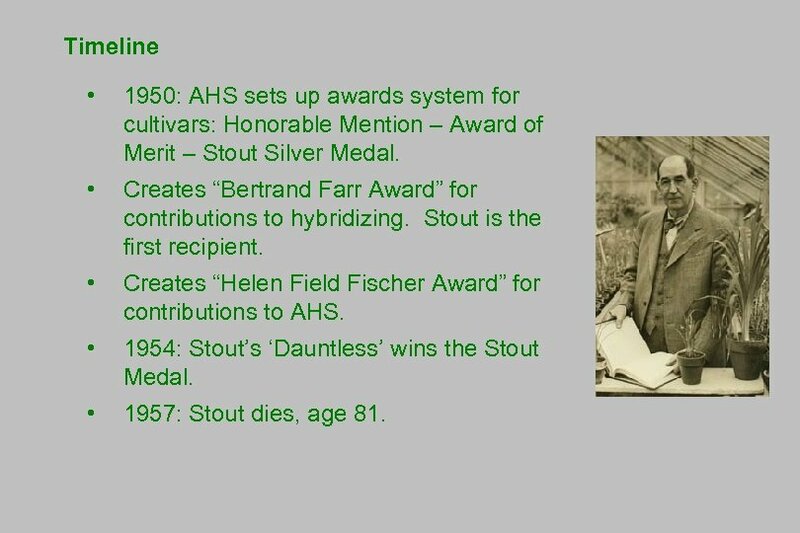 Timeline • 1950: AHS sets up awards system for cultivars: Honorable Mention – Award of Merit – Stout Silver Medal. 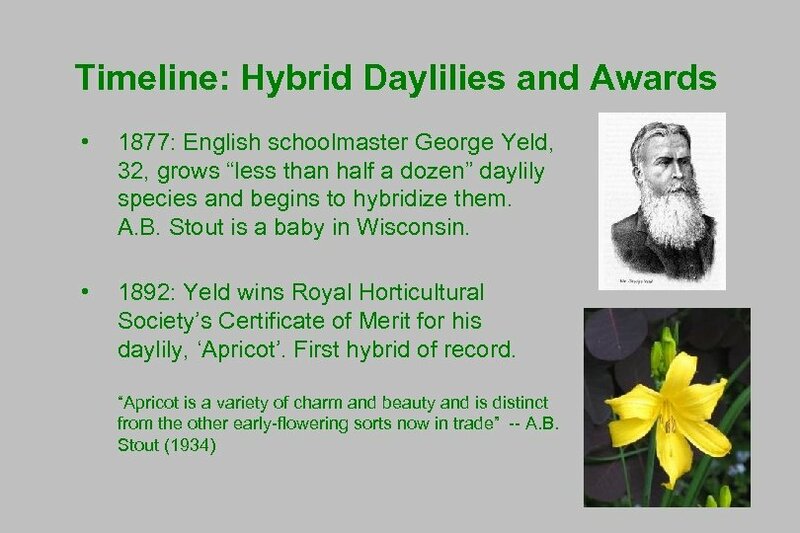 • Creates “Bertrand Farr Award” for contributions to hybridizing. Stout is the first recipient. • Creates “Helen Field Fischer Award” for contributions to AHS. • 1954: Stout’s ‘Dauntless’ wins the Stout Medal. • 1957: Stout dies, age 81. Timeline • 1961: AHS adds specialty award categories. • Specialty awards may change from time to time: new ones added, some discontinued. 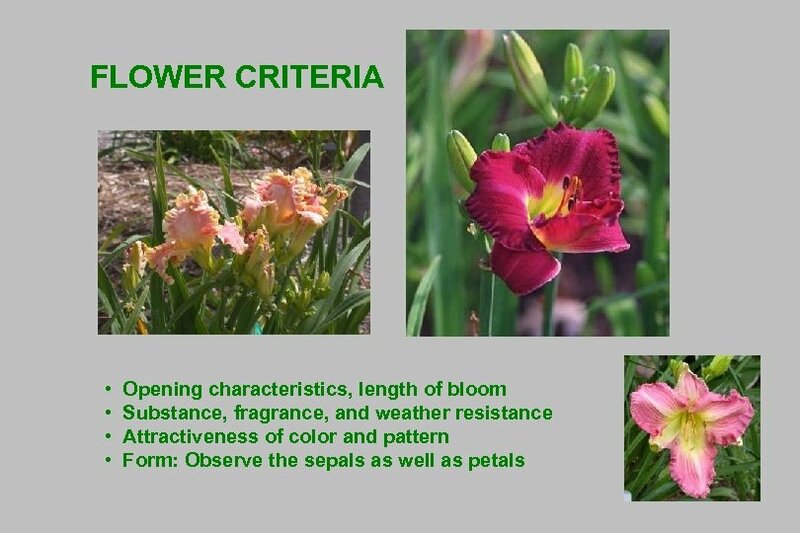 • Examples: deletion of award for Fragrance, recent additions for Extra Early bloom and Extra Large Flowers. 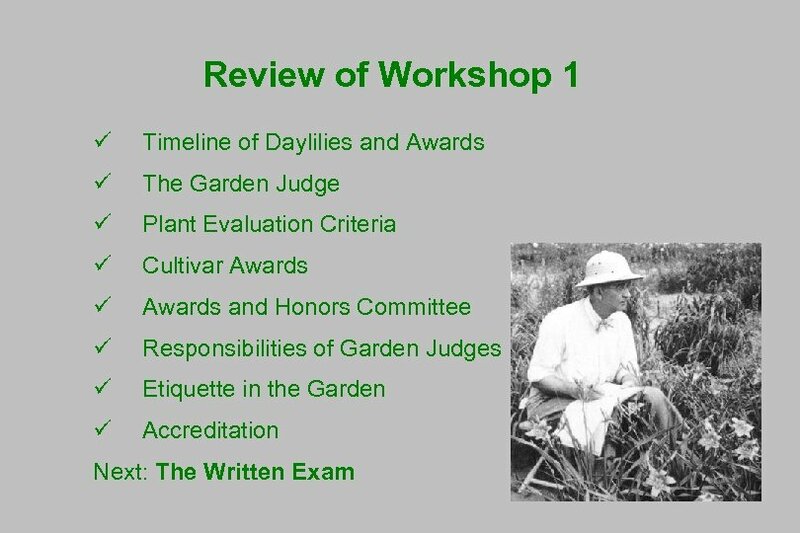 • 1997: AHS develops a formal curriculum for training Garden Judges. 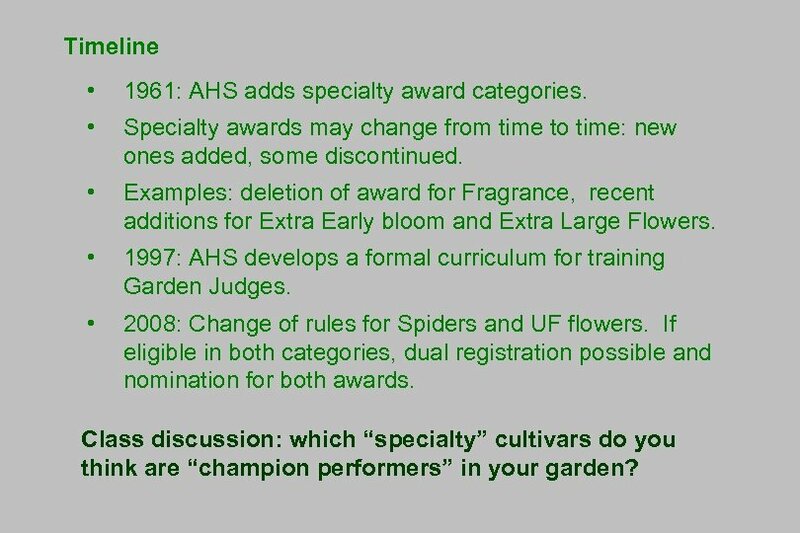 • 2008: Change of rules for Spiders and UF flowers. If eligible in both categories, dual registration possible and nomination for both awards. 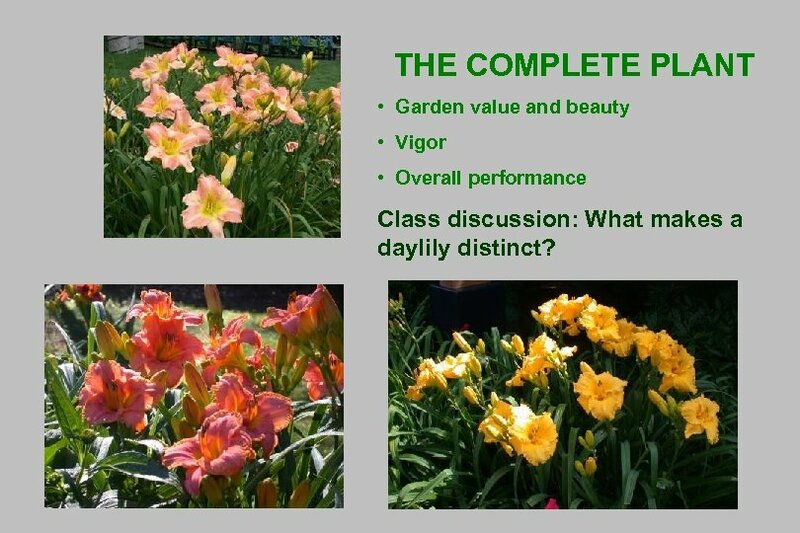 Class discussion: which “specialty” cultivars do you think are “champion performers” in your garden? 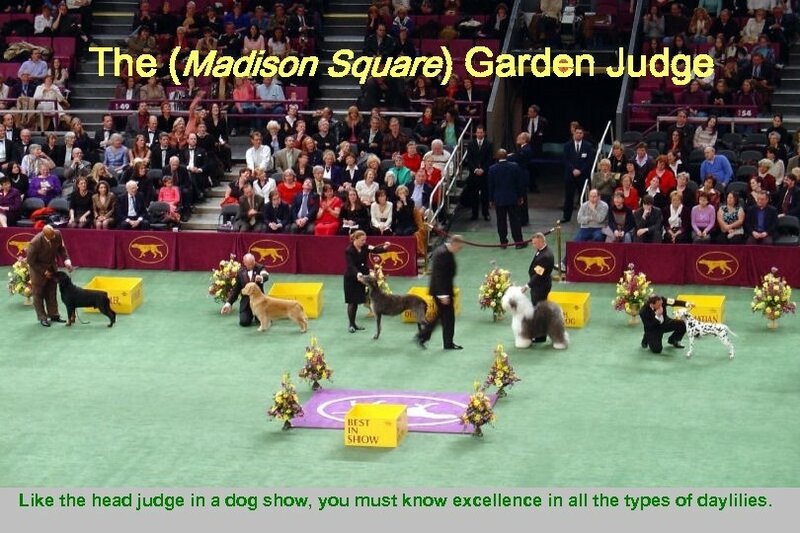 The (Madison Square) Garden Judge Like the head judge in a dog show, you must know excellence in all the types of daylilies. 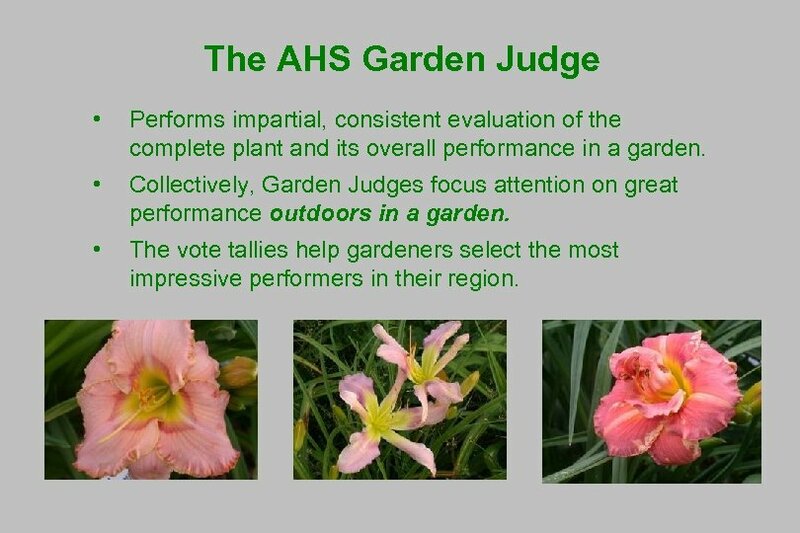 The AHS Garden Judge • Performs impartial, consistent evaluation of the complete plant and its overall performance in a garden. 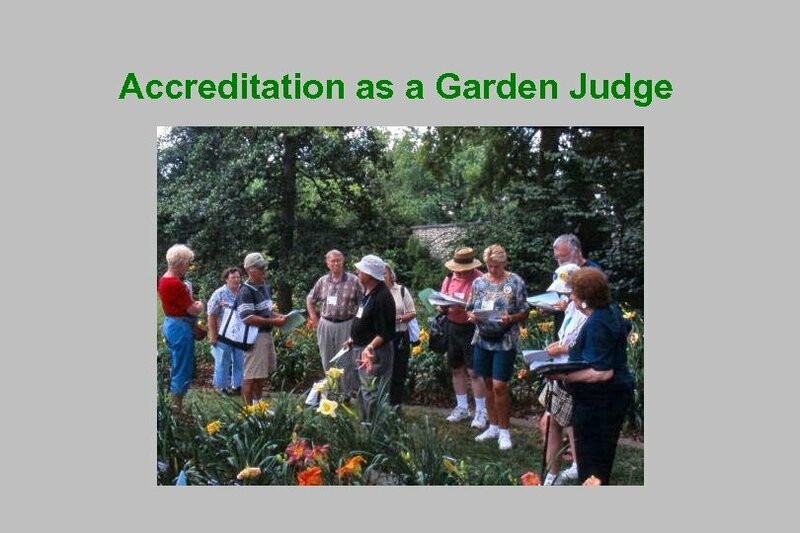 • Collectively, Garden Judges focus attention on great performance outdoors in a garden. 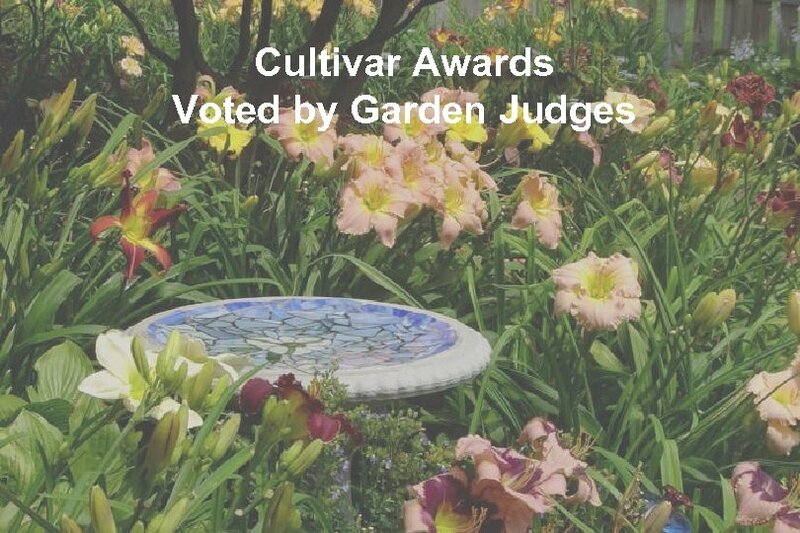 • The vote tallies help gardeners select the most impressive performers in their region. The Garden Judge’s Work: • Observes complete plants in established clumps, under varied conditions, and at different times of year. • Serves the AHS mission through extended plant evaluation within one AHS region. Class Discussion: What are the performance differences between a new plant and an established clump? 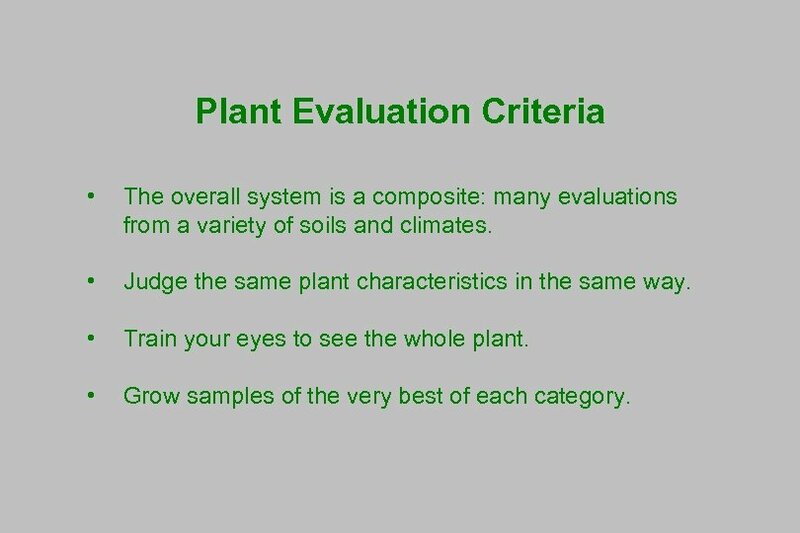 Plant Evaluation Criteria • The overall system is a composite: many evaluations from a variety of soils and climates. 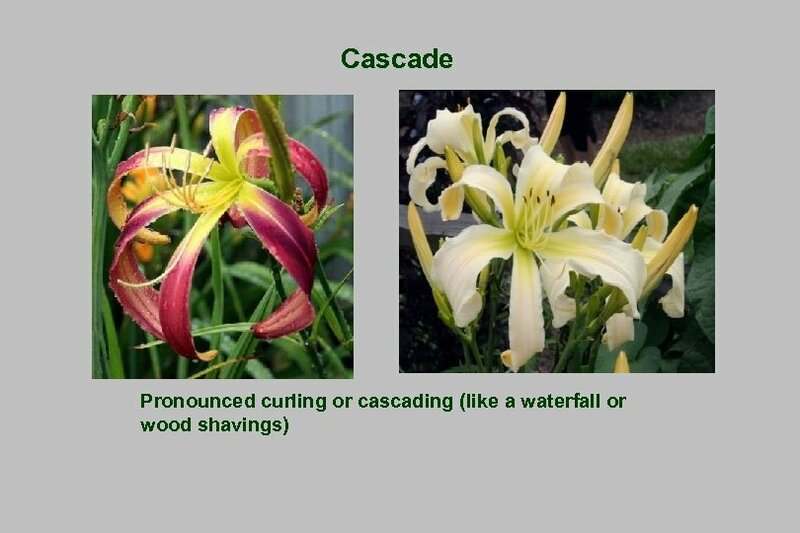 • Judge the same plant characteristics in the same way. • Train your eyes to see the whole plant. • Grow samples of the very best of each category. 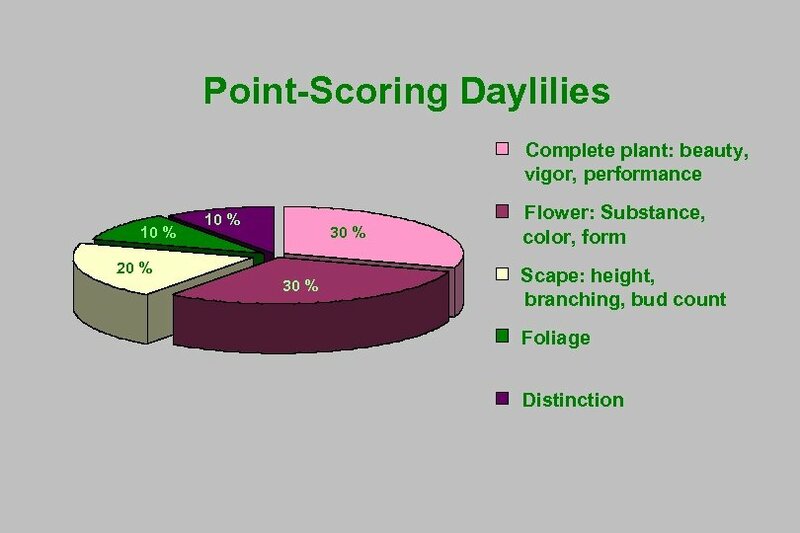 THE COMPLETE PLANT • Garden value and beauty • Vigor • Overall performance Class discussion: What makes a daylily distinct? 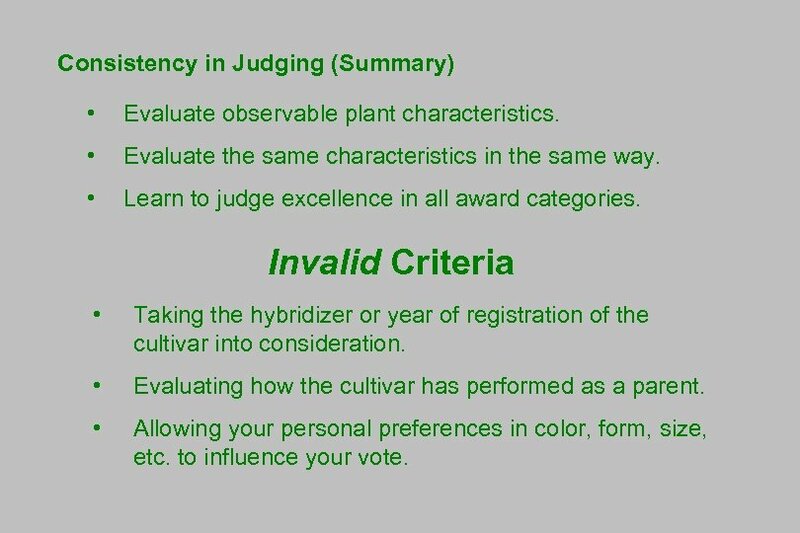 Consistency in Judging (Summary) • Evaluate observable plant characteristics. • Evaluate the same characteristics in the same way. • Learn to judge excellence in all award categories. Invalid Criteria • Taking the hybridizer or year of registration of the cultivar into consideration. • Evaluating how the cultivar has performed as a parent. • Allowing your personal preferences in color, form, size, etc. to influence your vote. Honorable Mention • The HM is the first official “stamp of approval. ” • To win: 20 votes needed from at least 4 regions. 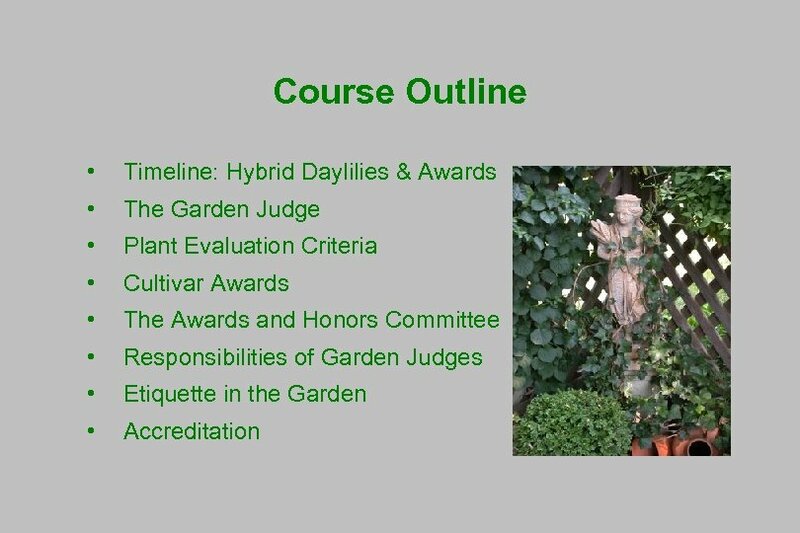 • Garden judges may vote for up to 12 cultivars as observed in their region. • The list of HM nominees is extensive. You won’t know them all. Only vote for cultivars that you know well enough to commend. 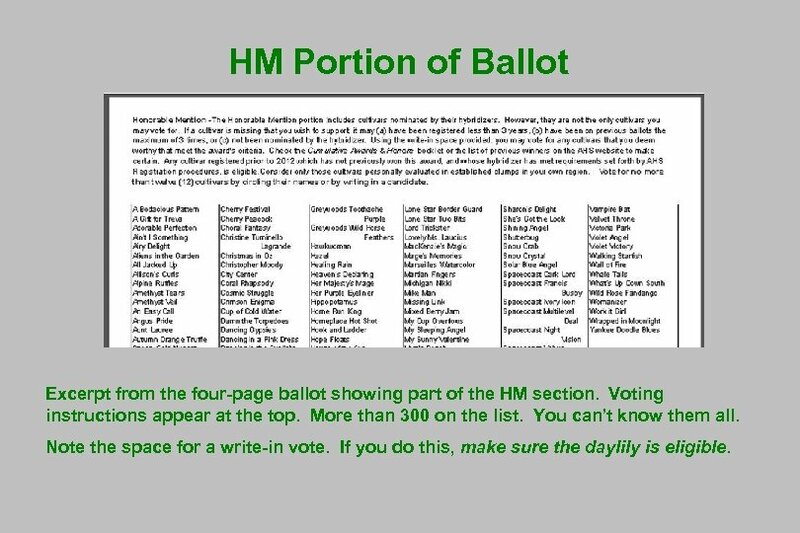 HM Portion of Ballot Excerpt from the four-page ballot showing part of the HM section. Voting instructions appear at the top. More than 300 on the list. You can’t know them all. Note the space for a write-in vote. 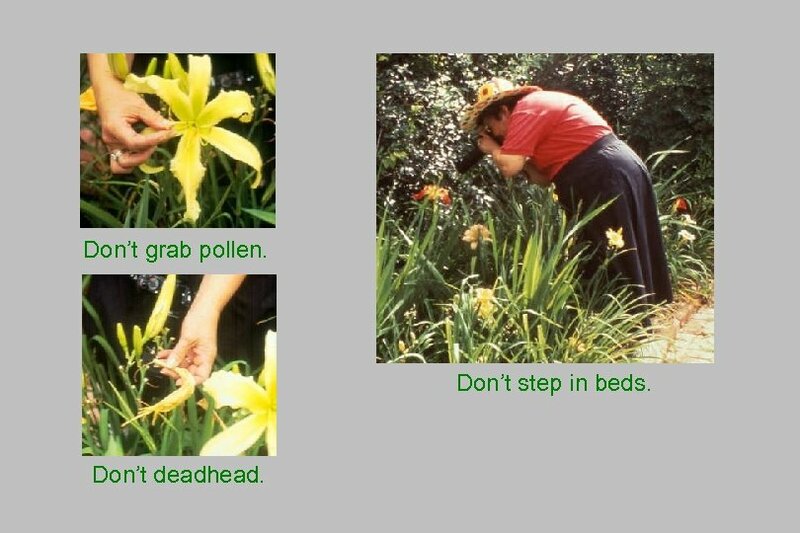 If you do this, make sure the daylily is eligible. 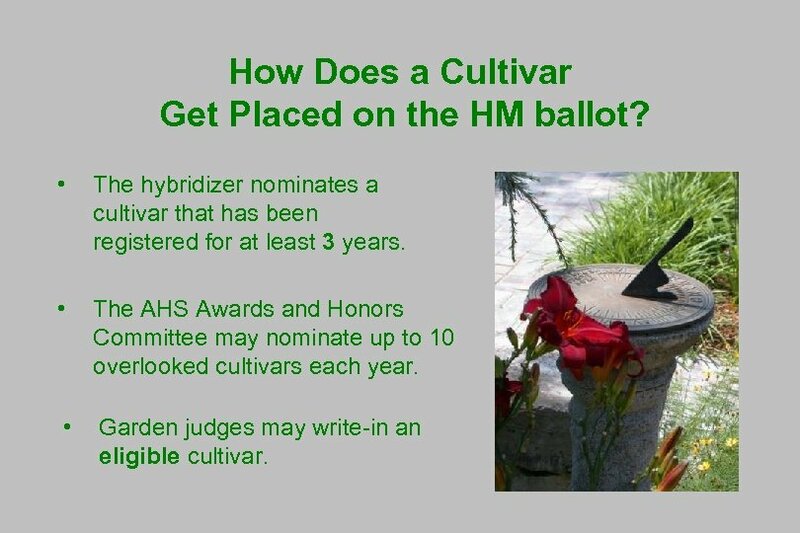 How Does a Cultivar Get Placed on the HM ballot? • The hybridizer nominates a cultivar that has been registered for at least 3 years. 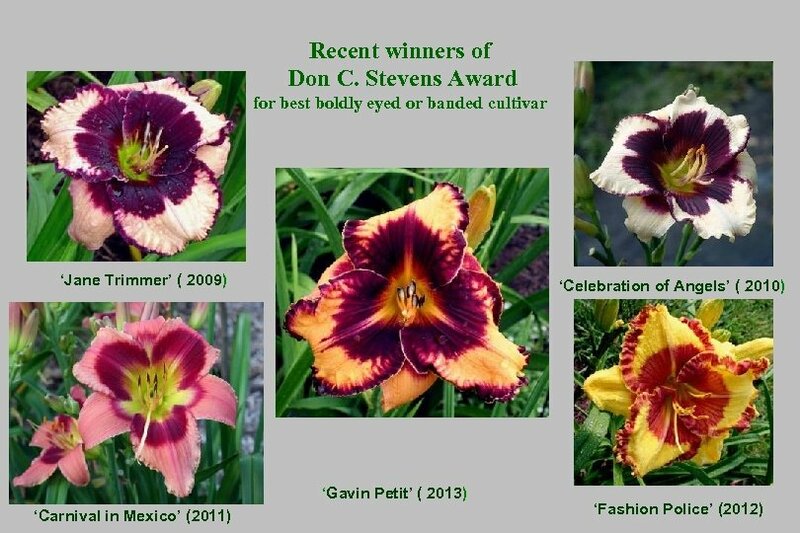 • The AHS Awards and Honors Committee may nominate up to 10 overlooked cultivars each year. 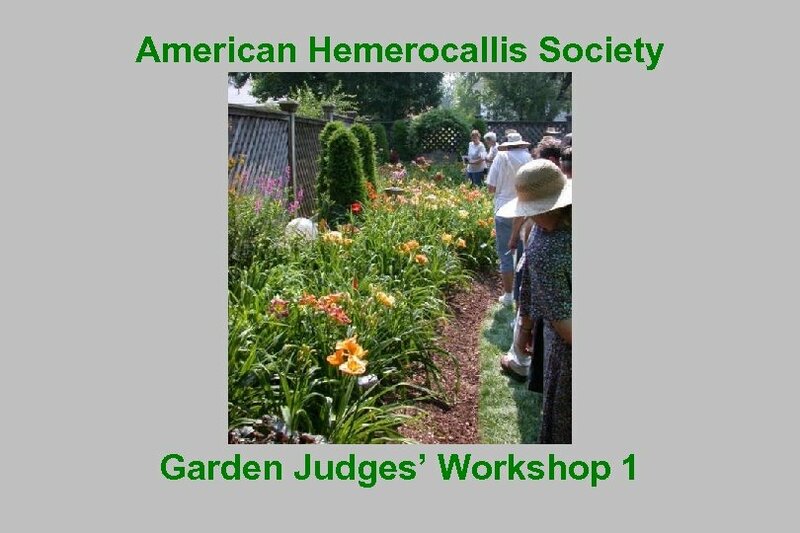 • Garden judges may write-in an eligible cultivar. 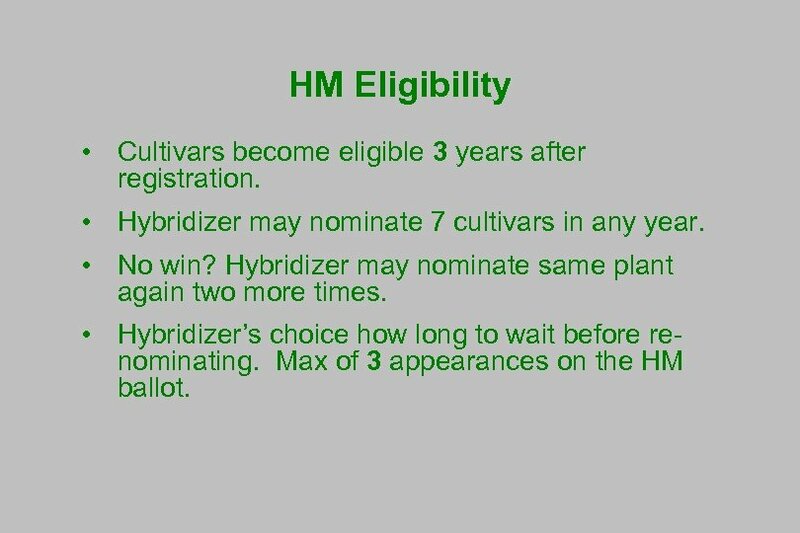 HM Eligibility • Cultivars become eligible 3 years after registration. • Hybridizer may nominate 7 cultivars in any year. • No win? Hybridizer may nominate same plant again two more times. • Hybridizer’s choice how long to wait before renominating. Max of 3 appearances on the HM ballot. 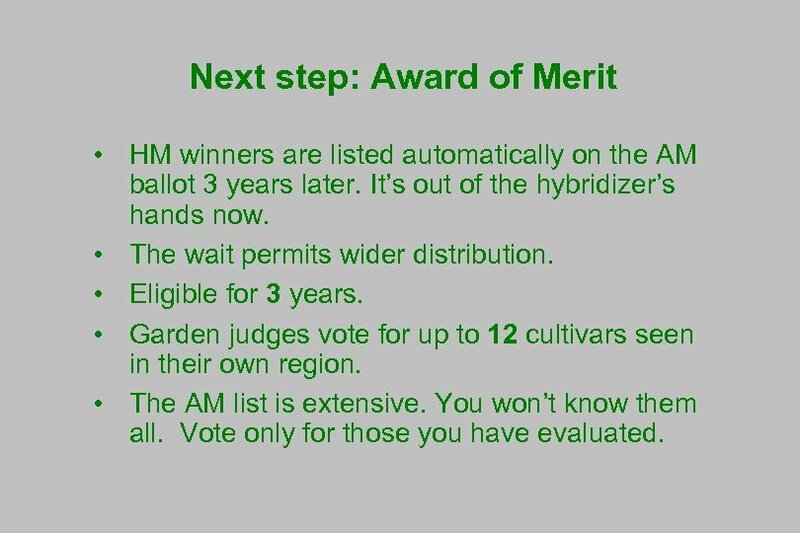 Next step: Award of Merit • HM winners are listed automatically on the AM ballot 3 years later. It’s out of the hybridizer’s hands now. • The wait permits wider distribution. • Eligible for 3 years. • Garden judges vote for up to 12 cultivars seen in their own region. • The AM list is extensive. You won’t know them all. Vote only for those you have evaluated. 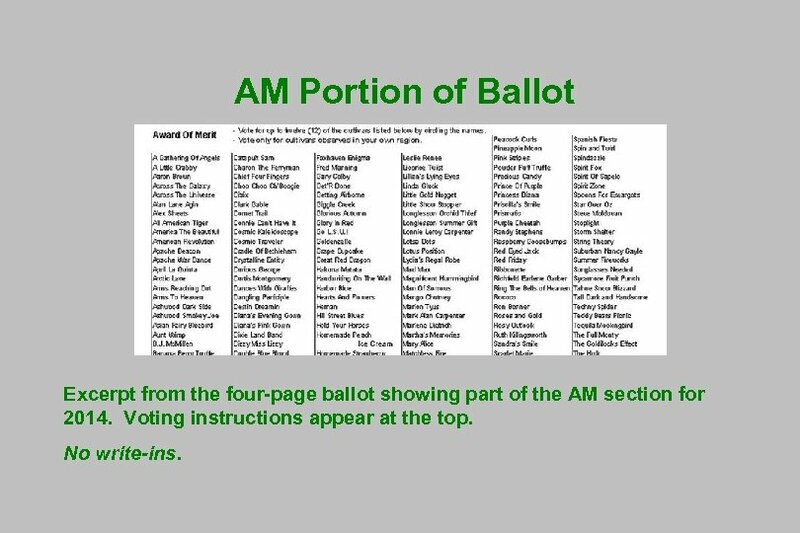 AM Portion of Ballot Excerpt from the four-page ballot showing part of the AM section for 2014. Voting instructions appear at the top. No write-ins. 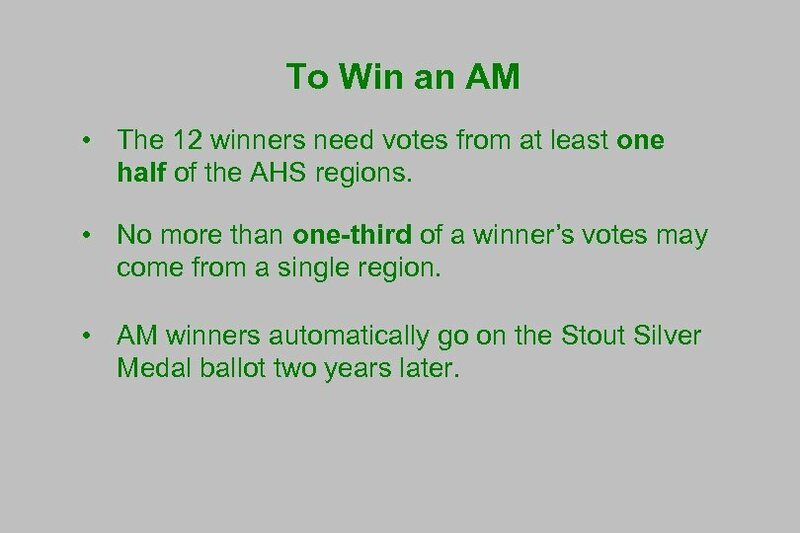 To Win an AM • The 12 winners need votes from at least one half of the AHS regions. • No more than one-third of a winner’s votes may come from a single region. 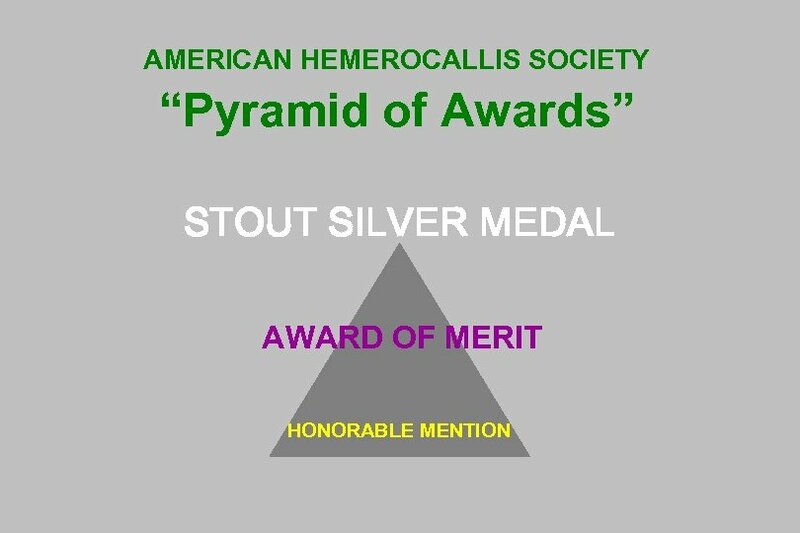 • AM winners automatically go on the Stout Silver Medal ballot two years later. 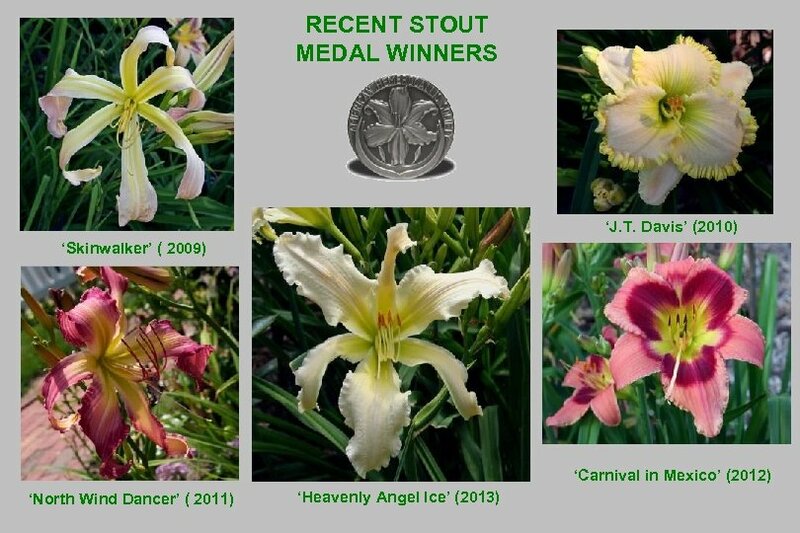 Stout Silver Medal • The top honor for a daylily. • Candidates eligible for 3 years. • 35 candidates per year (last year’s winner isn’t there). 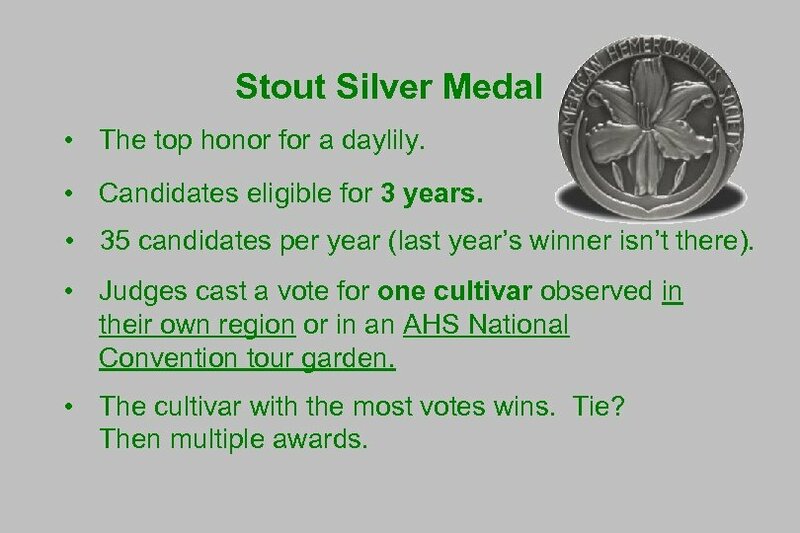 • Judges cast a vote for one cultivar observed in their own region or in an AHS National Convention tour garden. • The cultivar with the most votes wins. Tie? Then multiple awards. 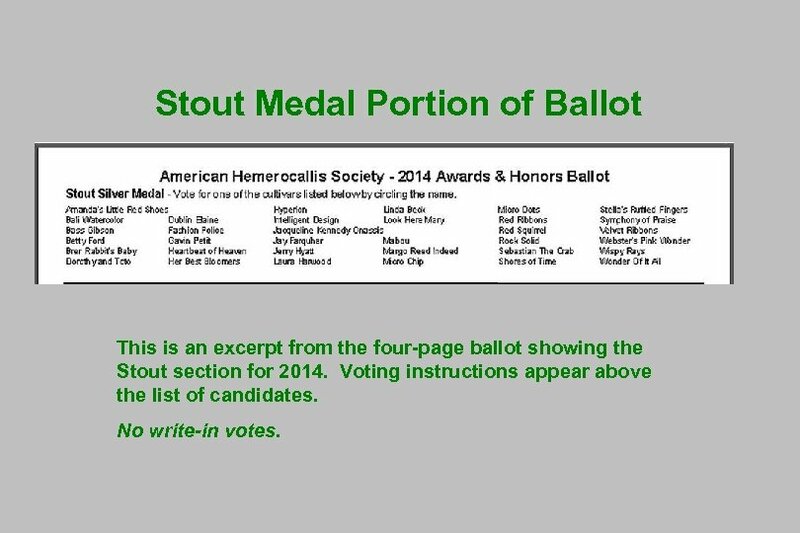 Stout Medal Portion of Ballot This is an excerpt from the four-page ballot showing the Stout section for 2014. Voting instructions appear above the list of candidates. No write-in votes. 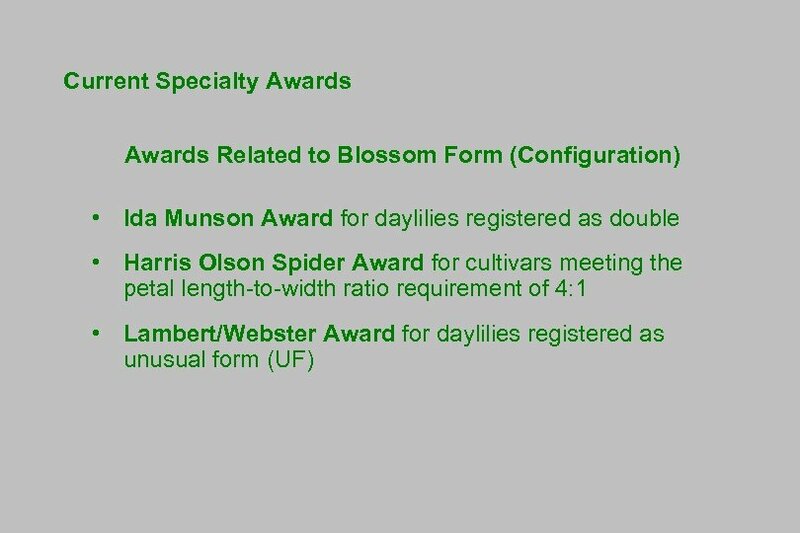 Specialty Awards • These awards recognize cultivars that have excelled within certain categories. • Cultivars must be registered for a minimum of 5 years prior to balloting. 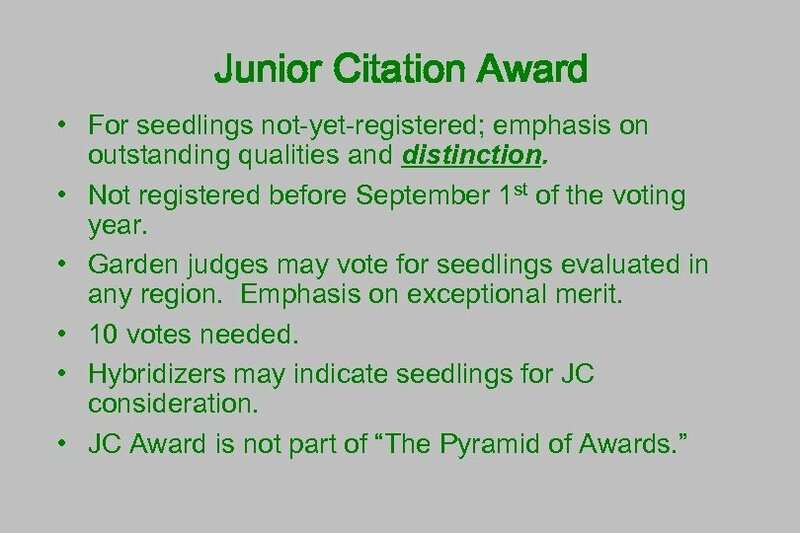 • Garden judges may cast votes for cultivars observed in their own regions or in the AHS National Convention tour gardens, unless otherwise stated. • Write-in votes are allowed. • The cultivar receiving the most votes wins. 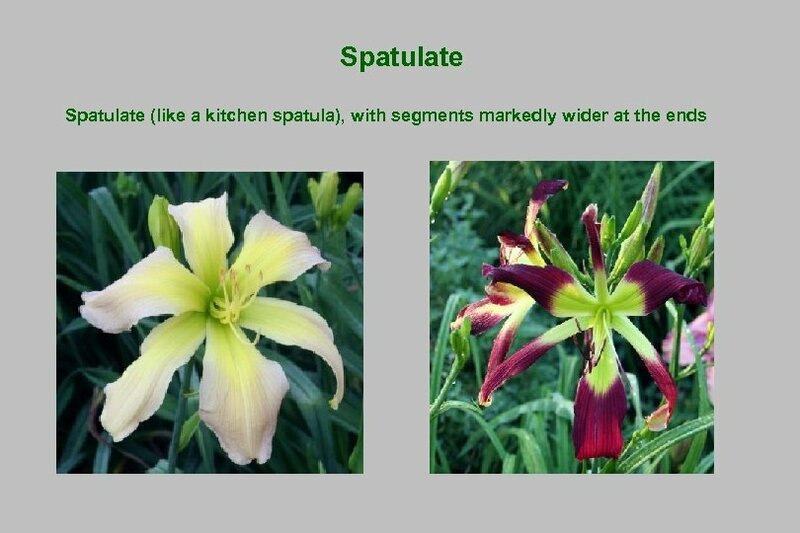 • Evaluate the whole plant; vote for the best daylily of its type. 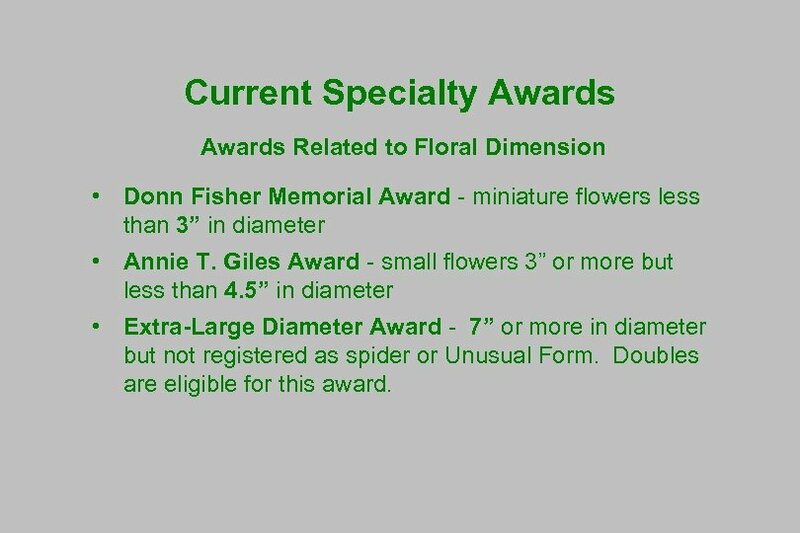 Current Specialty Awards Related to Floral Dimension • Donn Fisher Memorial Award - miniature flowers less than 3” in diameter • Annie T. Giles Award - small flowers 3” or more but less than 4. 5” in diameter • Extra-Large Diameter Award - 7” or more in diameter but not registered as spider or Unusual Form. Doubles are eligible for this award. 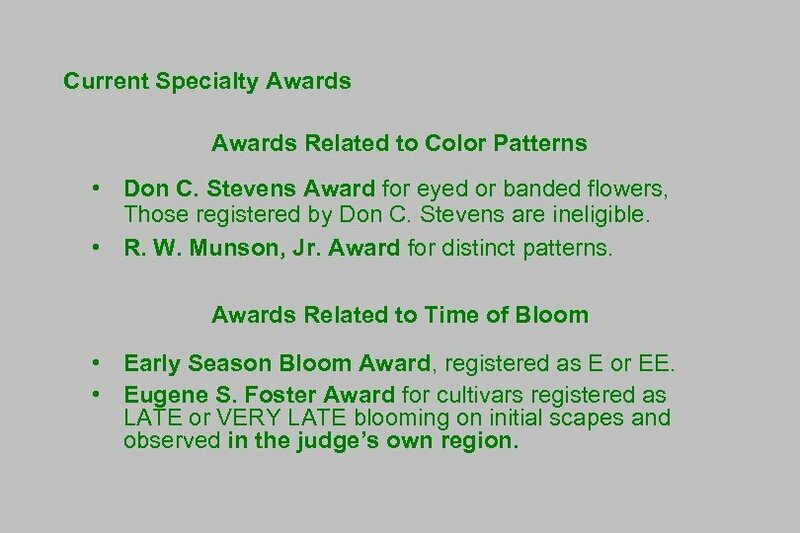 Current Specialty Awards Related to Color Patterns • Don C. Stevens Award for eyed or banded flowers, Those registered by Don C. Stevens are ineligible. 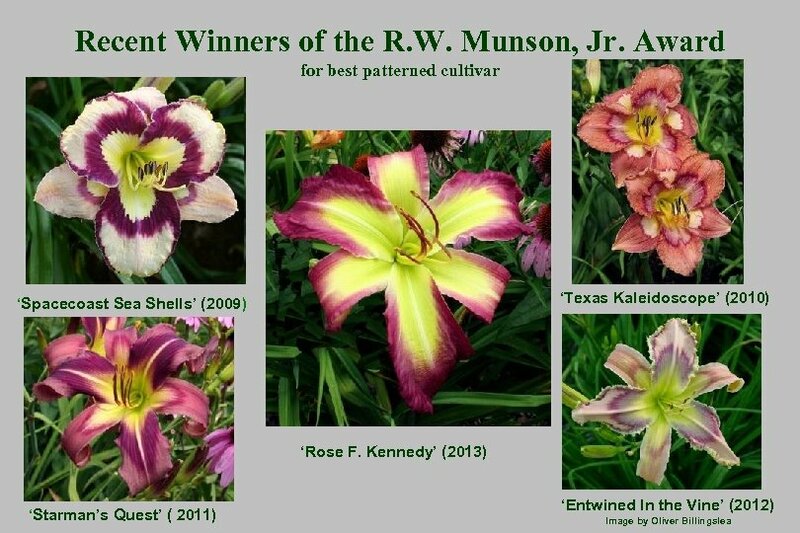 • R. W. Munson, Jr. Award for distinct patterns. Awards Related to Time of Bloom • Early Season Bloom Award, registered as E or EE. 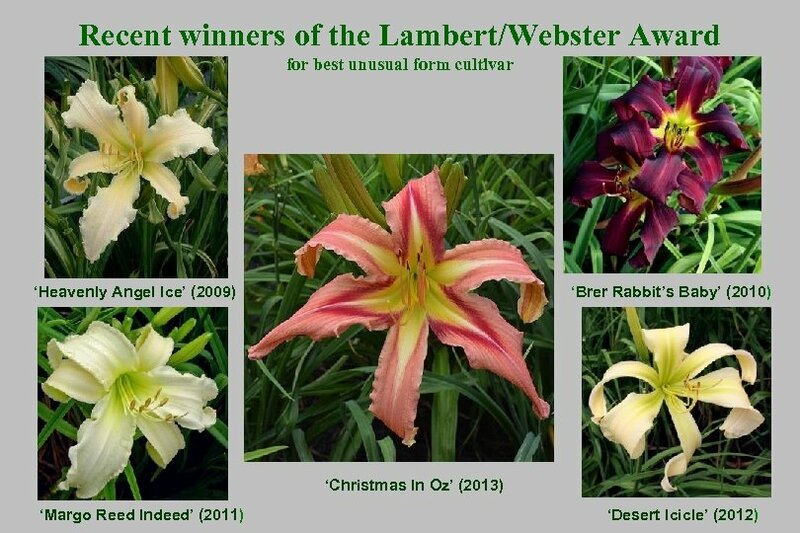 • Eugene S. Foster Award for cultivars registered as LATE or VERY LATE blooming on initial scapes and observed in the judge’s own region. 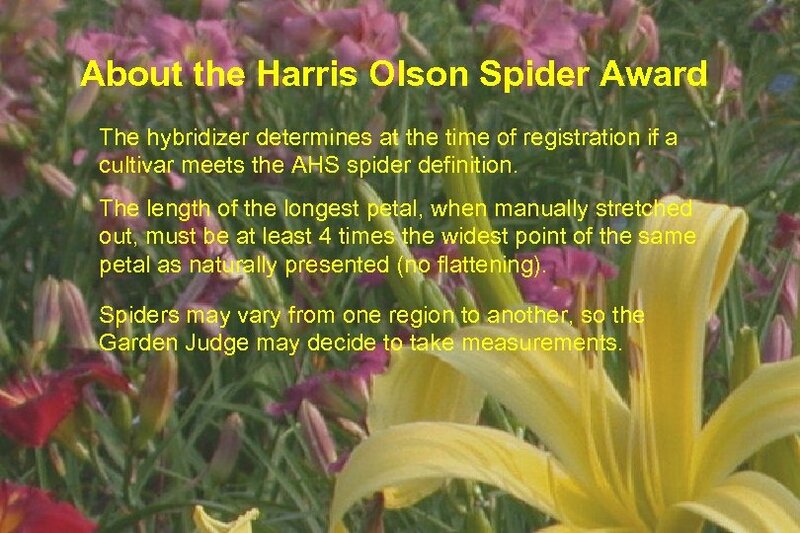 About the Harris Olson Spider Award The hybridizer determines at the time of registration if a cultivar meets the AHS spider definition. The length of the longest petal, when manually stretched out, must be at least 4 times the widest point of the same petal as naturally presented (no flattening). Spiders may vary from one region to another, so the Garden Judge may decide to take measurements. 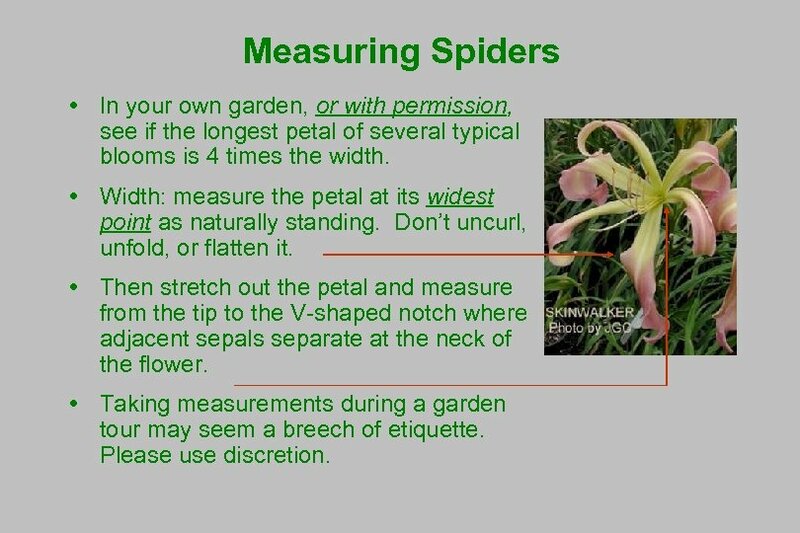 Measuring Spiders In your own garden, or with permission, see if the longest petal of several typical blooms is 4 times the width. Width: measure the petal at its widest point as naturally standing. Don’t uncurl, unfold, or flatten it. Then stretch out the petal and measure from the tip to the V-shaped notch where adjacent sepals separate at the neck of the flower. Taking measurements during a garden tour may seem a breech of etiquette. Please use discretion. 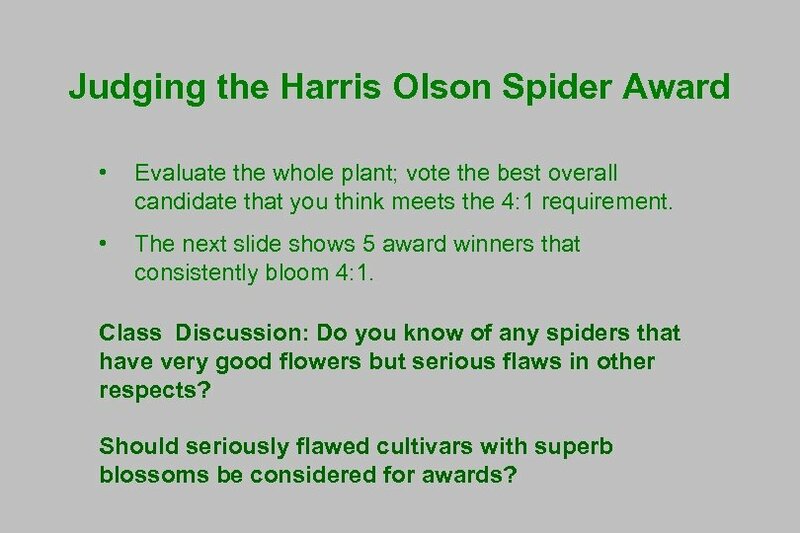 Judging the Harris Olson Spider Award • Evaluate the whole plant; vote the best overall candidate that you think meets the 4: 1 requirement. 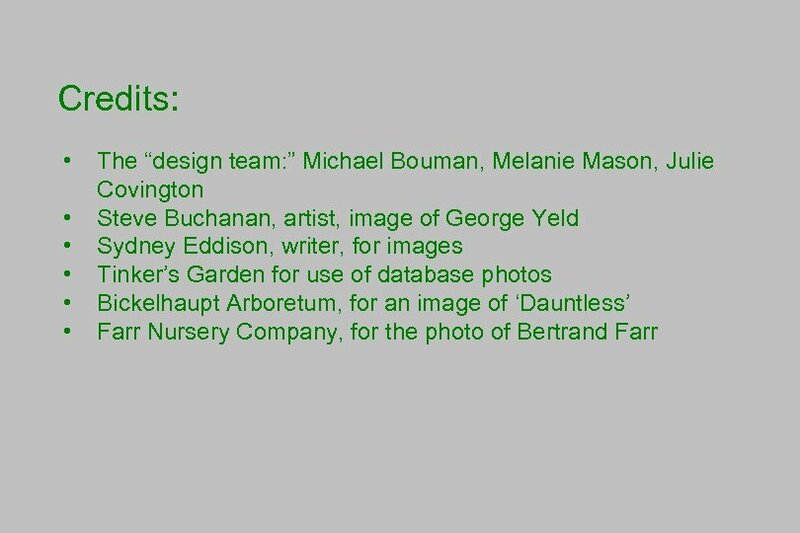 • The next slide shows 5 award winners that consistently bloom 4: 1. Class Discussion: Do you know of any spiders that have very good flowers but serious flaws in other respects? Should seriously flawed cultivars with superb blossoms be considered for awards? 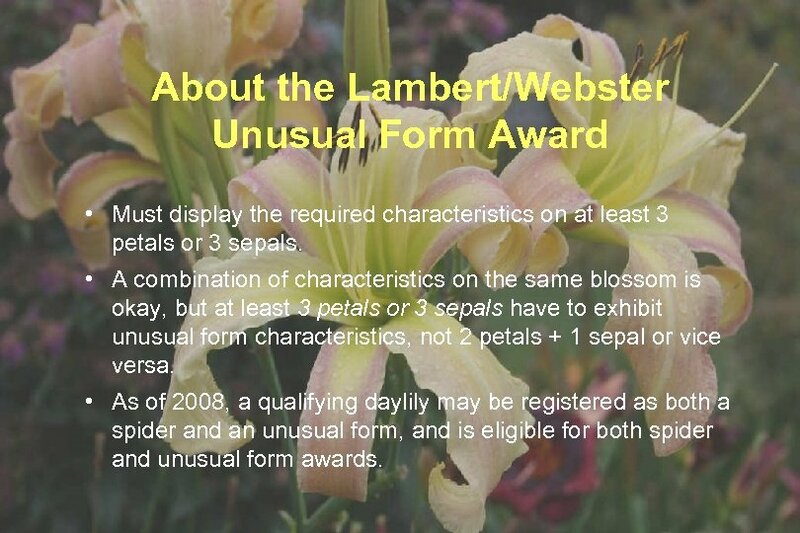 About the Lambert/Webster Unusual Form Award • Must display the required characteristics on at least 3 petals or 3 sepals. 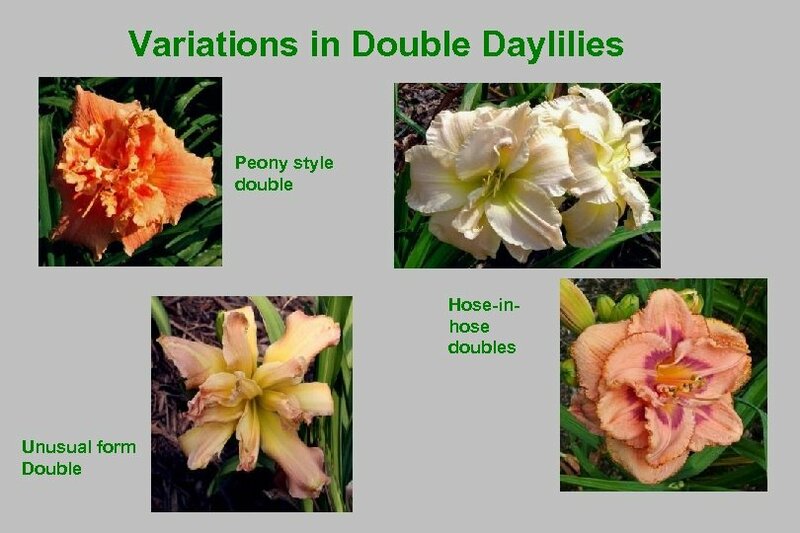 • A combination of characteristics on the same blossom is okay, but at least 3 petals or 3 sepals have to exhibit unusual form characteristics, not 2 petals + 1 sepal or vice versa. 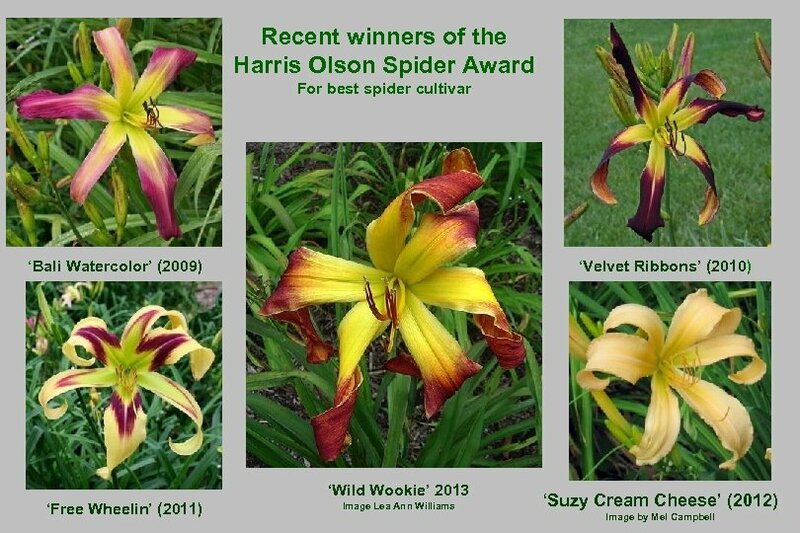 • As of 2008, a qualifying daylily may be registered as both a spider and an unusual form, and is eligible for both spider and unusual form awards. 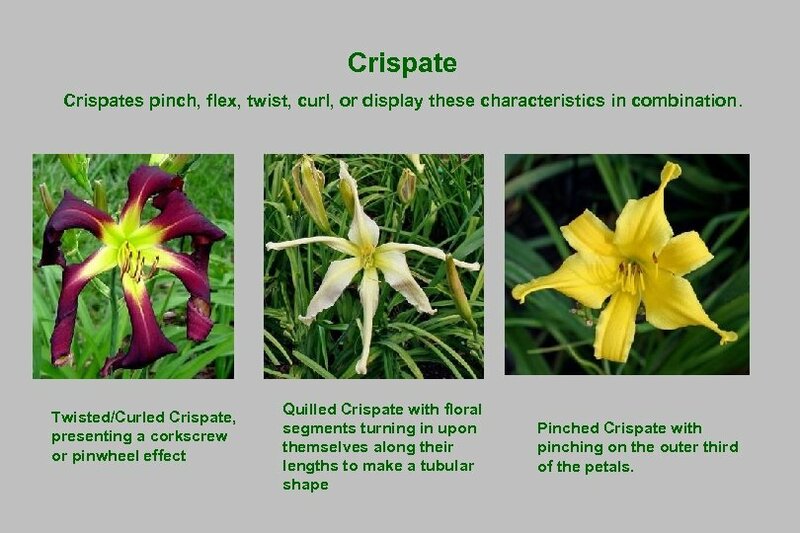 Crispates pinch, flex, twist, curl, or display these characteristics in combination. Twisted/Curled Crispate, presenting a corkscrew or pinwheel effect Quilled Crispate with floral segments turning in upon themselves along their lengths to make a tubular shape Pinched Crispate with pinching on the outer third of the petals. Unusual Forms often exhibit more than one of the characteristics and may vary from hour to hour and day to day. Twisted cascade presentation Reflexed spatulate with quilled sepals All 3 petals or all 3 sepals must exhibit an Unusual Form characteristic, though not necessarily the same characteristic. The UF definition recognizes variation in form. 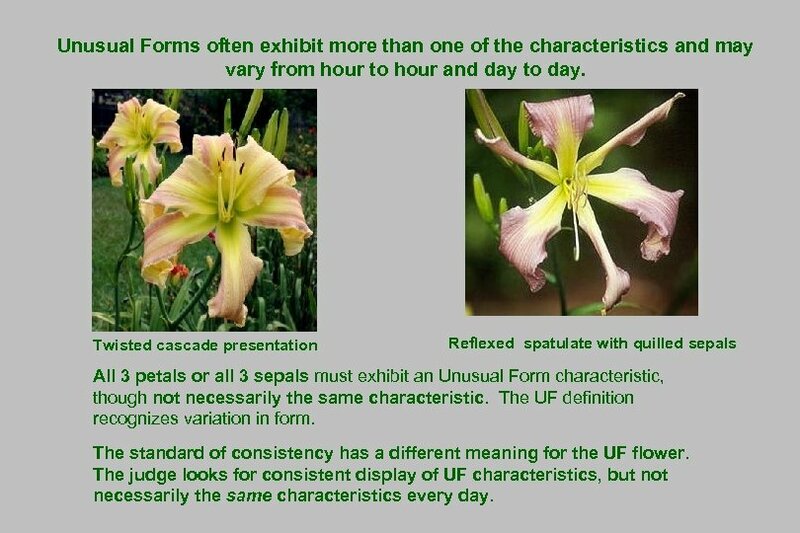 The standard of consistency has a different meaning for the UF flower. The judge looks for consistent display of UF characteristics, but not necessarily the same characteristics every day. 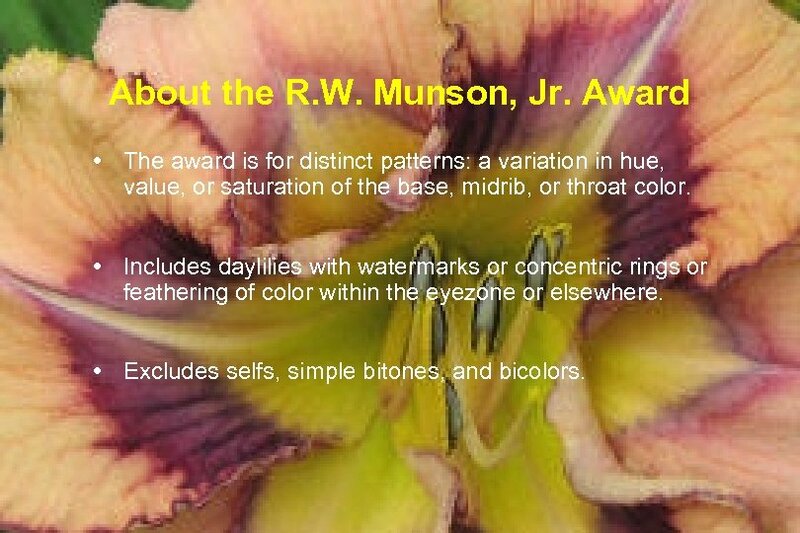 About the R. W. Munson, Jr. Award The award is for distinct patterns: a variation in hue, value, or saturation of the base, midrib, or throat color. 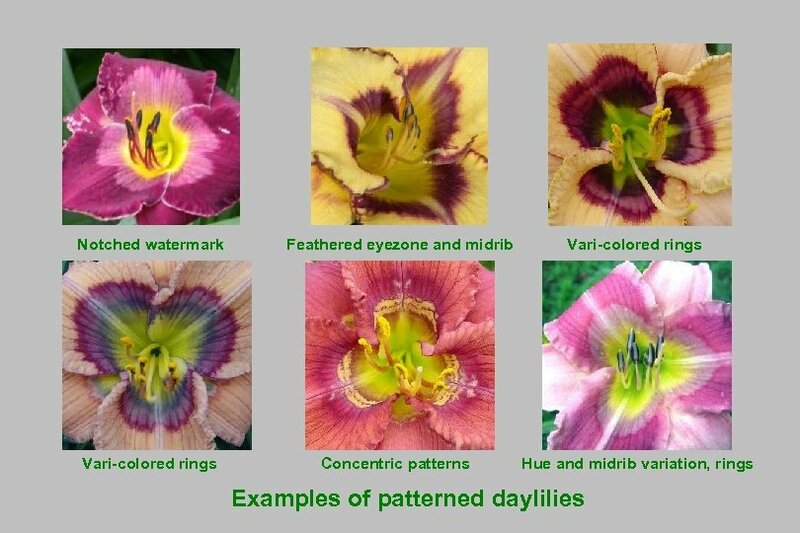 Includes daylilies with watermarks or concentric rings or feathering of color within the eyezone or elsewhere. Excludes selfs, simple bitones, and bicolors. 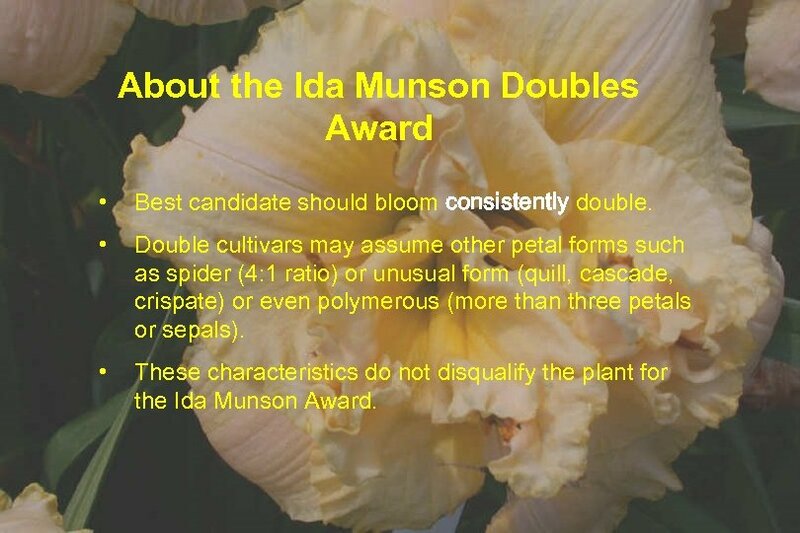 About the Ida Munson Doubles Award • Best candidate should bloom consistently double. 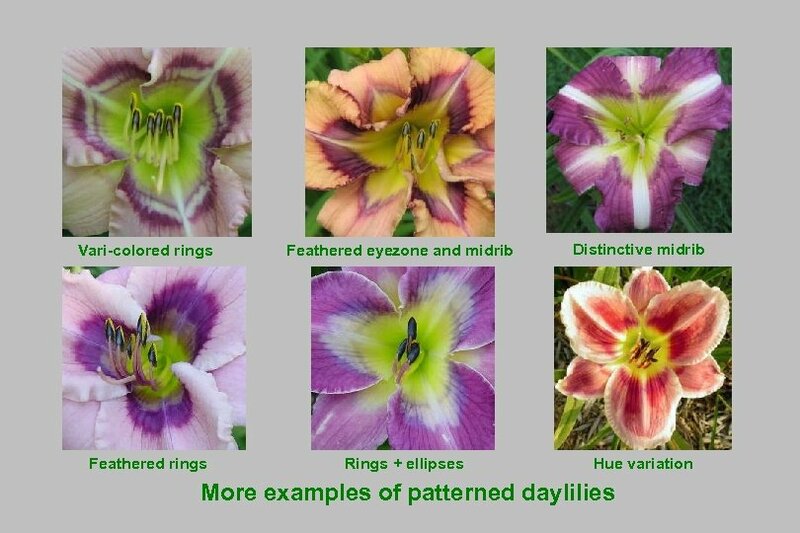 • Double cultivars may assume other petal forms such as spider (4: 1 ratio) or unusual form (quill, cascade, crispate) or even polymerous (more than three petals or sepals). • These characteristics do not disqualify the plant for the Ida Munson Award. 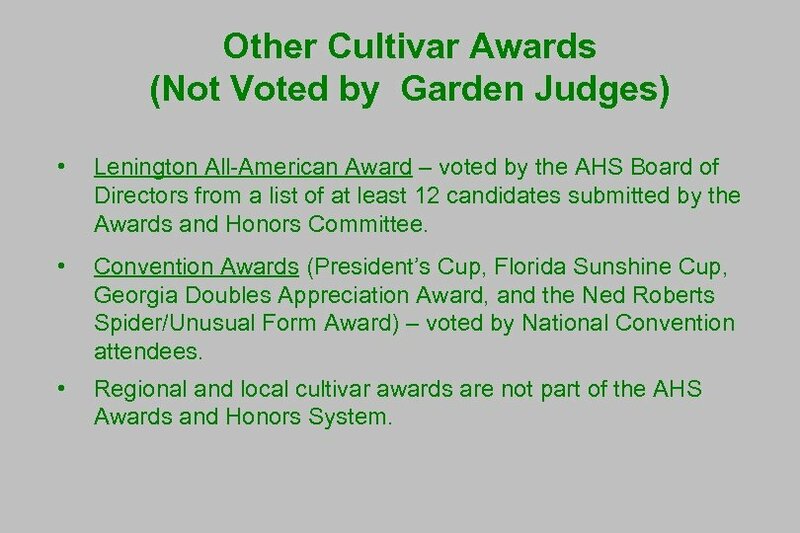 Other Cultivar Awards (Not Voted by Garden Judges) • Lenington All-American Award – voted by the AHS Board of Directors from a list of at least 12 candidates submitted by the Awards and Honors Committee. • Convention Awards (President’s Cup, Florida Sunshine Cup, Georgia Doubles Appreciation Award, and the Ned Roberts Spider/Unusual Form Award) – voted by National Convention attendees. 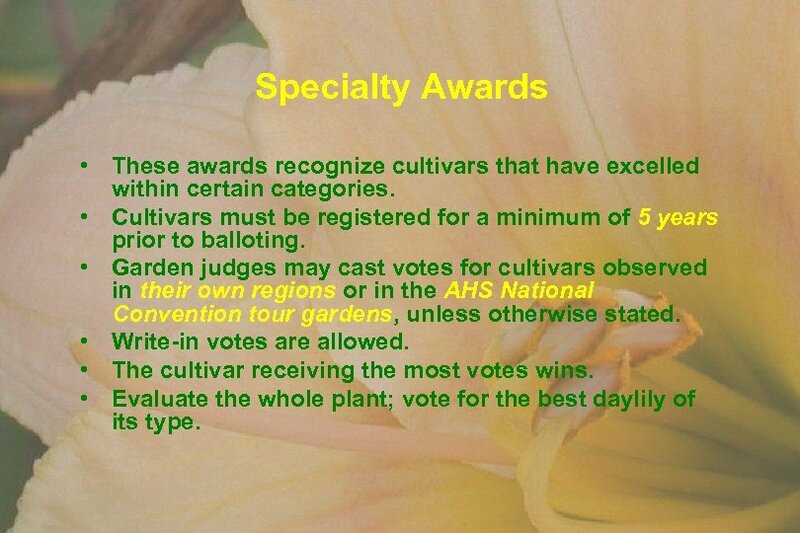 • Regional and local cultivar awards are not part of the AHS Awards and Honors System. 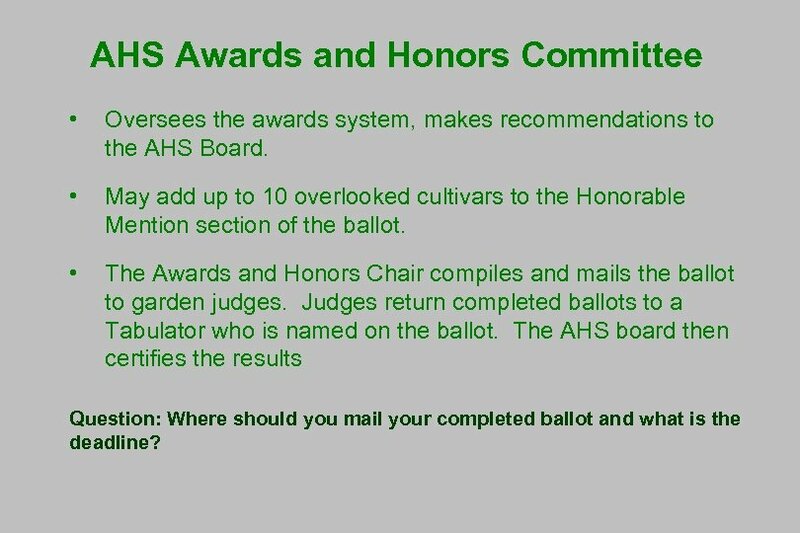 AHS Awards and Honors Committee • Oversees the awards system, makes recommendations to the AHS Board. 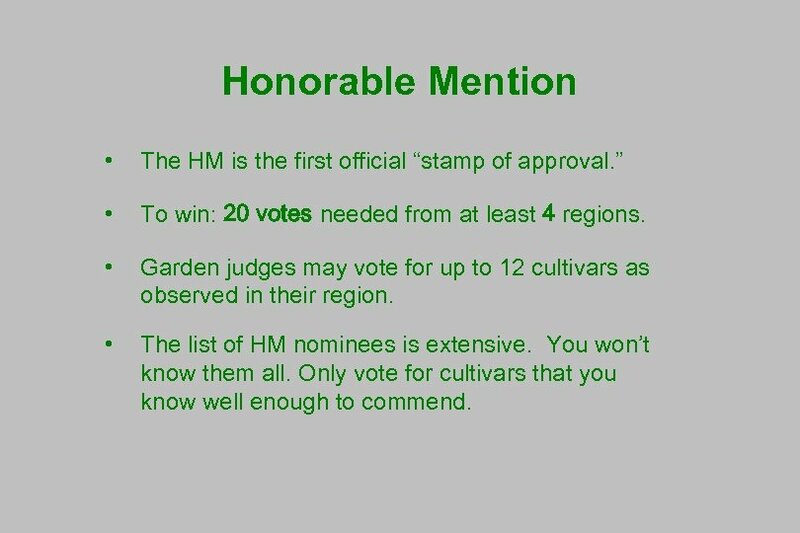 • May add up to 10 overlooked cultivars to the Honorable Mention section of the ballot. 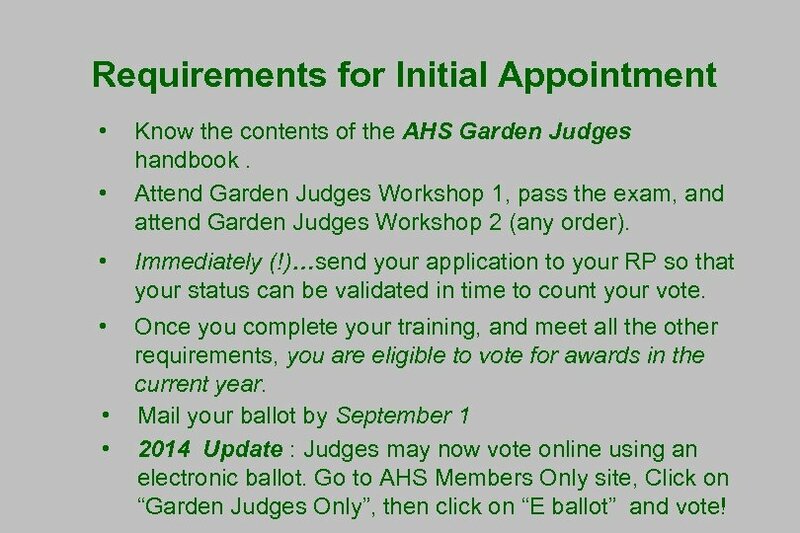 • The Awards and Honors Chair compiles and mails the ballot to garden judges. Judges return completed ballots to a Tabulator who is named on the ballot. The AHS board then certifies the results Question: Where should you mail your completed ballot and what is the deadline? 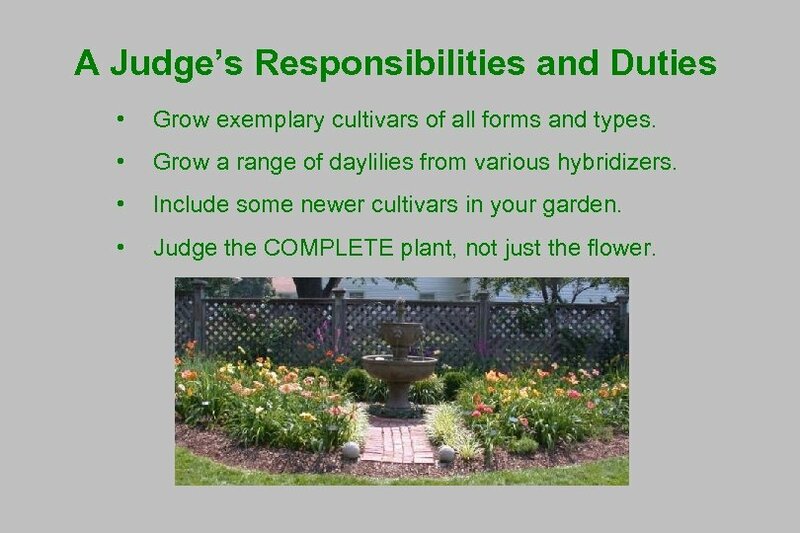 A Judge’s Responsibilities and Duties • Grow exemplary cultivars of all forms and types. • Grow a range of daylilies from various hybridizers. • Include some newer cultivars in your garden. • Judge the COMPLETE plant, not just the flower. Responsibilities and Duties • Visit gardens and evaluate daylilies. • Attend local, regional and national meetings. • Attend workshops. • Share skills with new judges and the public. • But…Decline any request to select someone’s seedlings for registration. 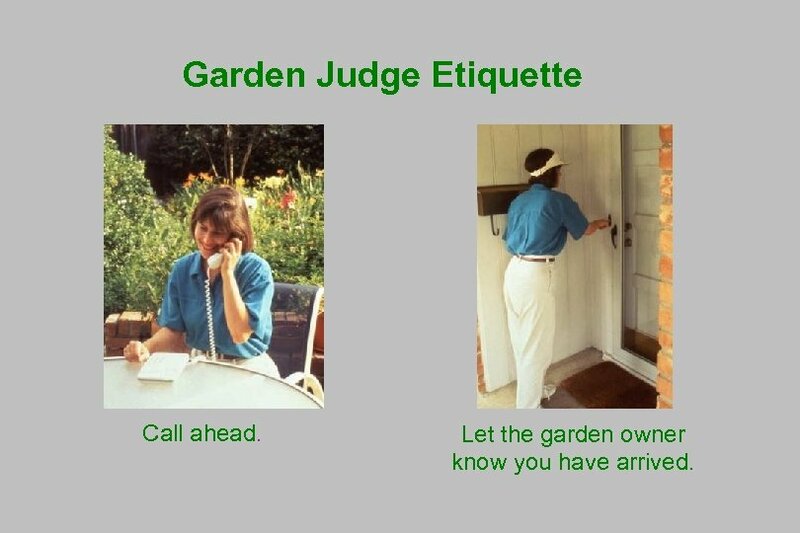 Garden Judge Etiquette Call ahead. Let the garden owner know you have arrived. 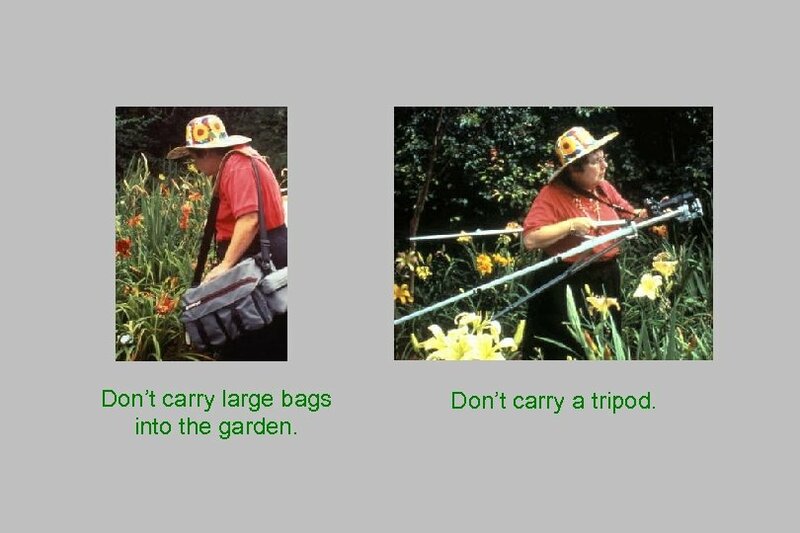 Don’t carry large bags into the garden. Don’t carry a tripod. Don’t do these things! Don’t grab pollen. Don’t step in beds. Don’t deadhead. 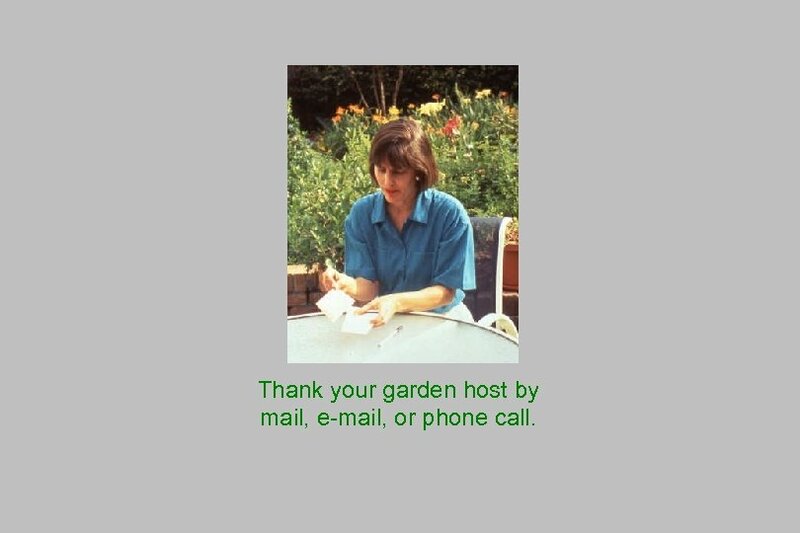 Thank your garden host by mail, e-mail, or phone call. Initial Appointment – 5 Years • Candidates must have held AHS membership for 24 consecutive months prior to applying. (Current dues paid!) • Training may begin after 12 months of membership. 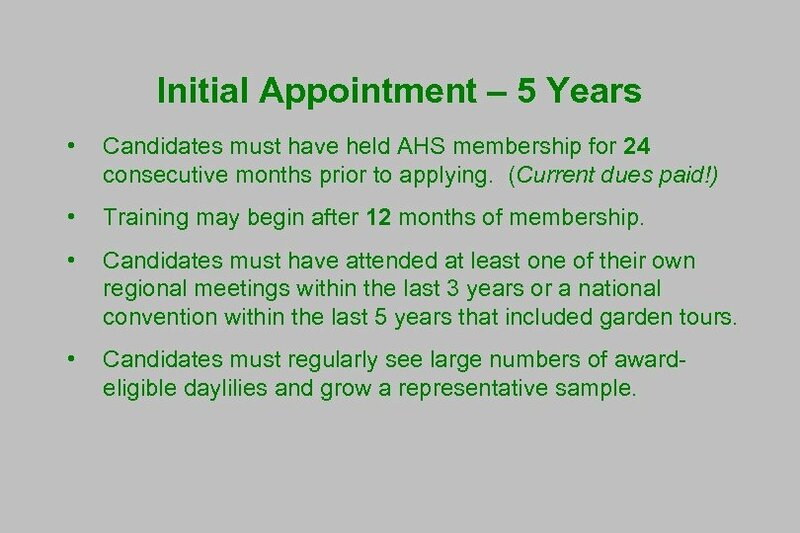 • Candidates must have attended at least one of their own regional meetings within the last 3 years or a national convention within the last 5 years that included garden tours. 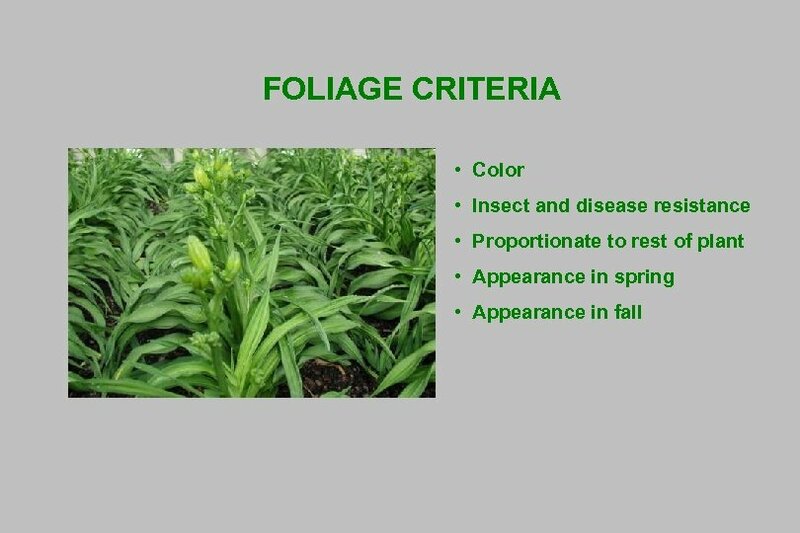 • Candidates must regularly see large numbers of awardeligible daylilies and grow a representative sample. Reappointment – 5 Years • You’ll be notified before your term expires. 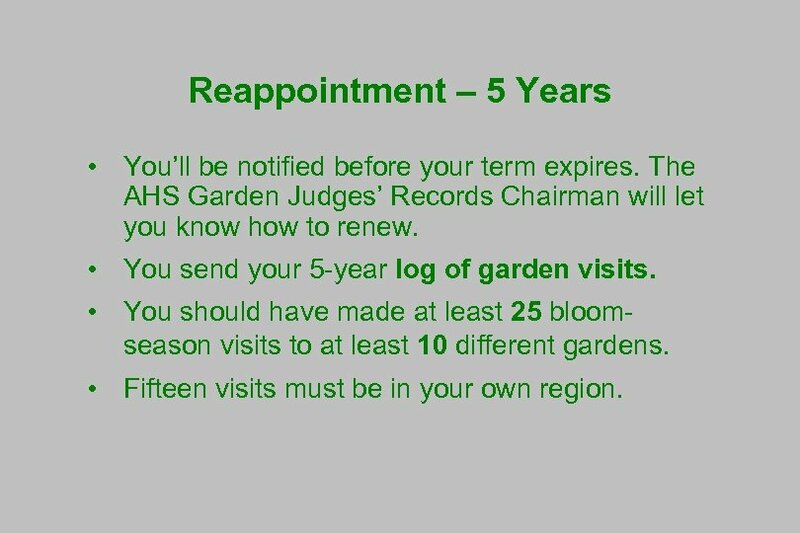 The AHS Garden Judges’ Records Chairman will let you know how to renew. • You send your 5 -year log of garden visits. • You should have made at least 25 bloomseason visits to at least 10 different gardens. • Fifteen visits must be in your own region. Don’t get shut out !!! If you don’t: • Mail your ballot each year by September 1 st. (If for some reason you cannot vote, contact the Garden Judges’ Records Chair. ) 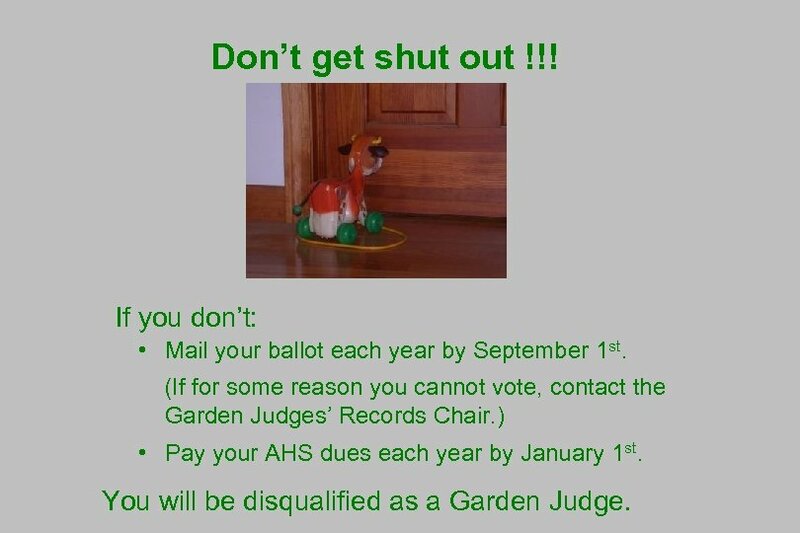 • Pay your AHS dues each year by January 1 st. You will be disqualified as a Garden Judge. Need help? 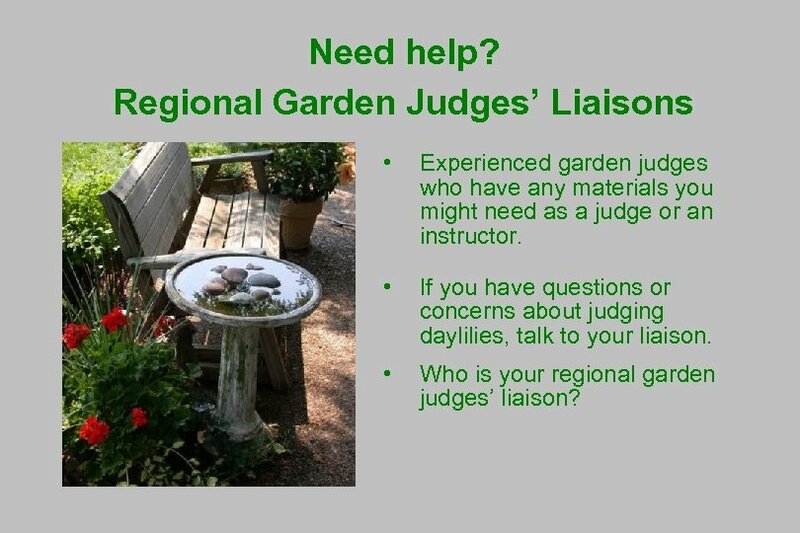 Regional Garden Judges’ Liaisons • Experienced garden judges who have any materials you might need as a judge or an instructor. 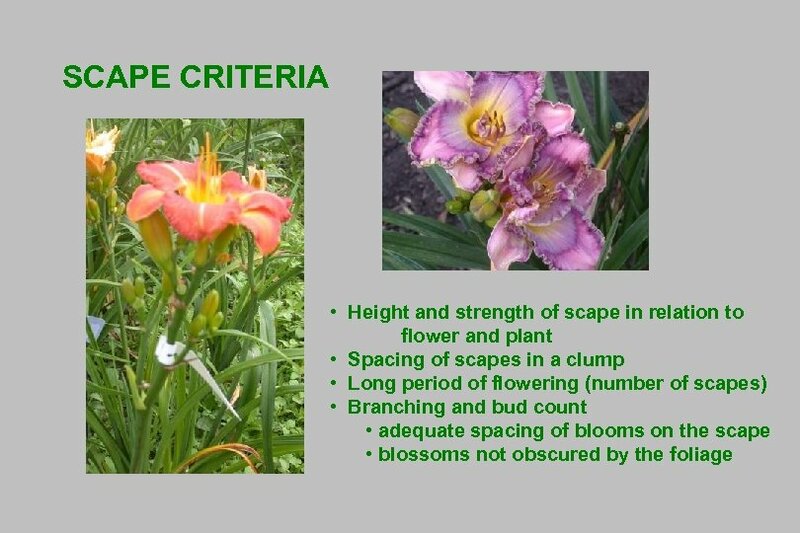 • If you have questions or concerns about judging daylilies, talk to your liaison. 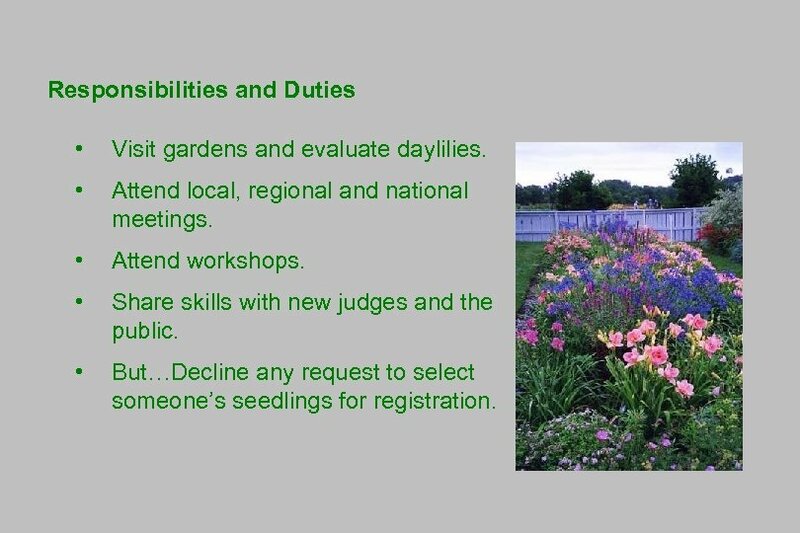 • Who is your regional garden judges’ liaison? Workshop Papers Attendance Sheet – everyone here must sign it. 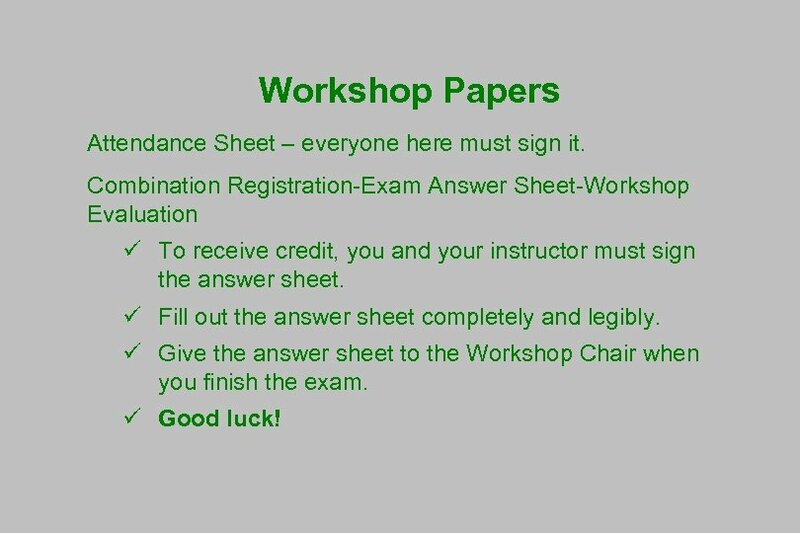 Combination Registration-Exam Answer Sheet-Workshop Evaluation ü To receive credit, you and your instructor must sign the answer sheet. ü Fill out the answer sheet completely and legibly. ü Give the answer sheet to the Workshop Chair when you finish the exam. ü Good luck!